Cherry blossom season is one of the most beautiful time of the year in Korea, the street is covered with the charming and romantic scenes like dramas thanks to the pink petals of cherry blossoms. 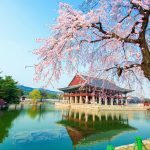 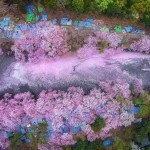 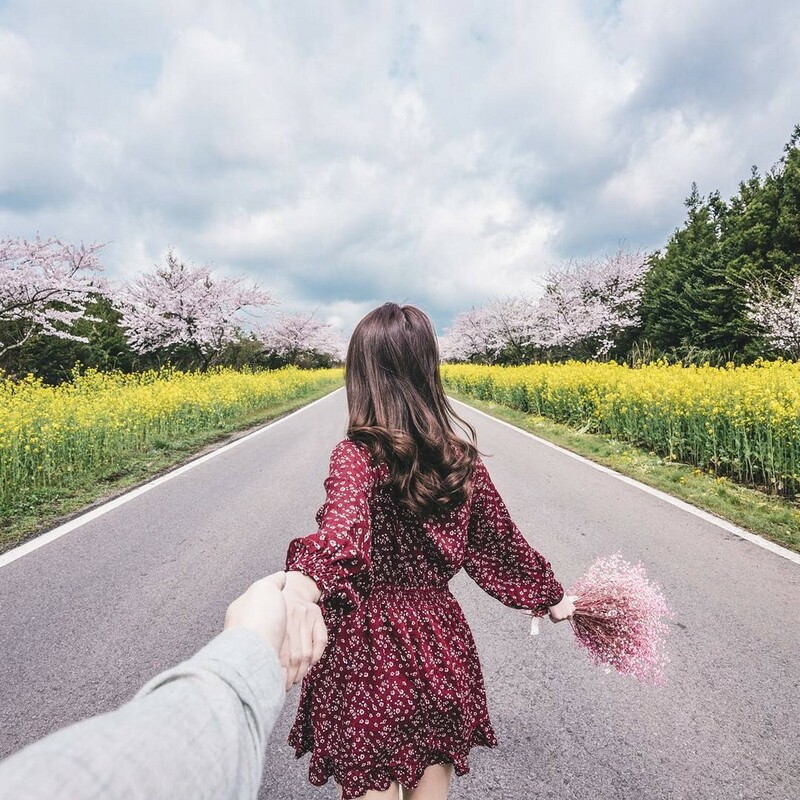 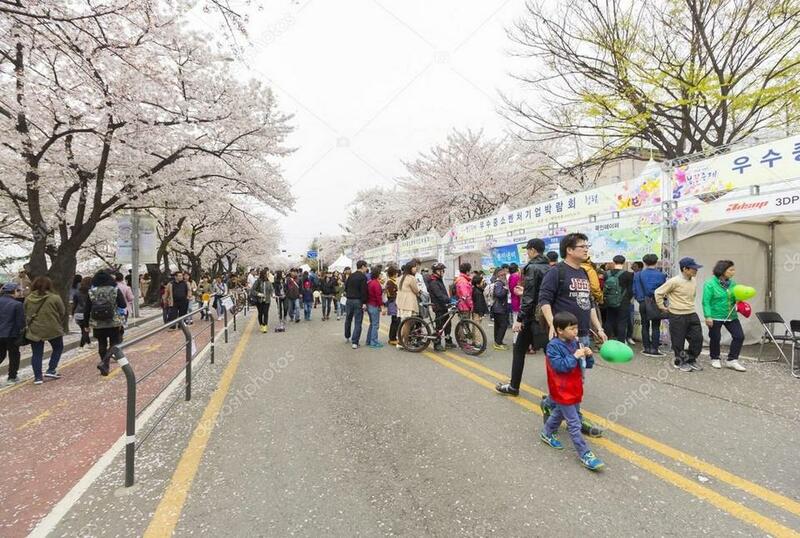 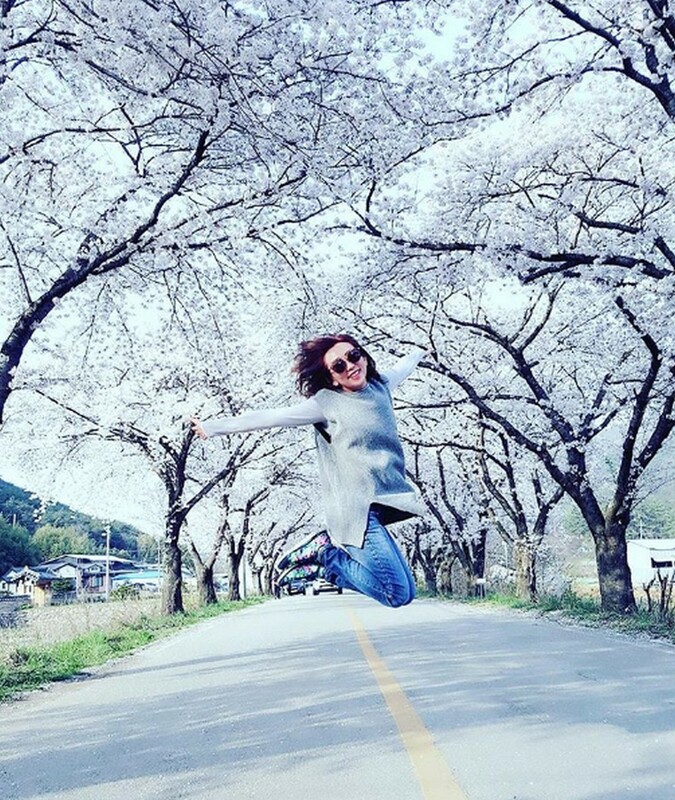 Let’s discover top 5 cherry blossom festivals in South Korea (Cherry blossom festival Korea, Cherry blossom festival Korea 2019, South Korea cherry blossom festival) includes dates, time, event… in 2019 with Living Nomads below. 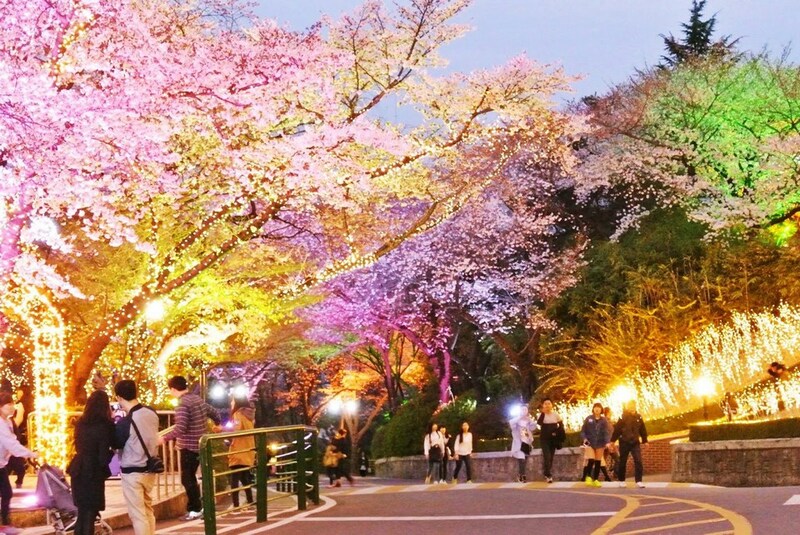 CherryBlossoms in Namsan mountain. 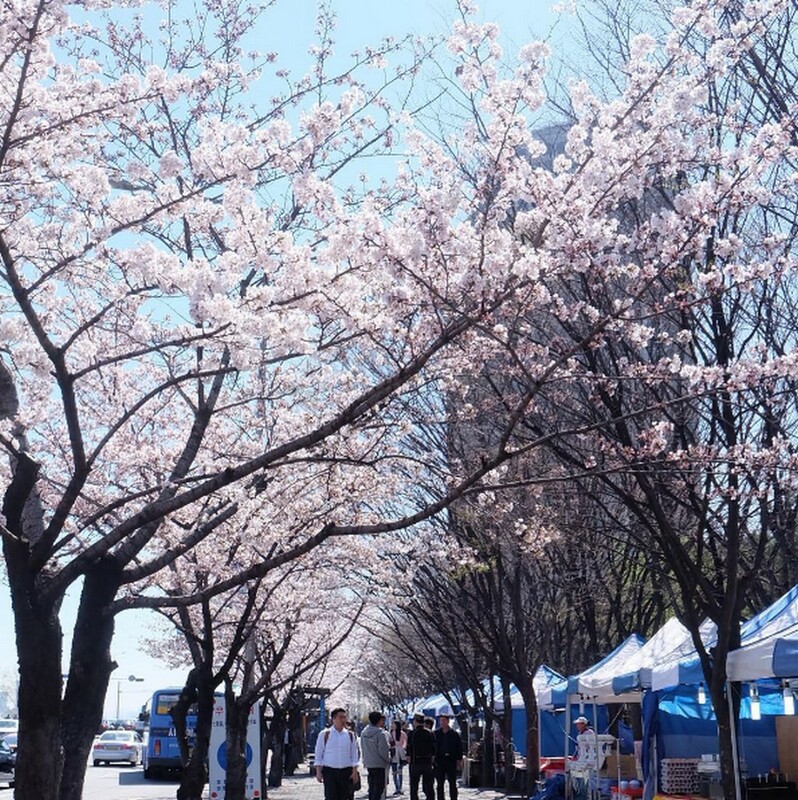 Credit: Cherry blossom festival Korea 2019 blog. 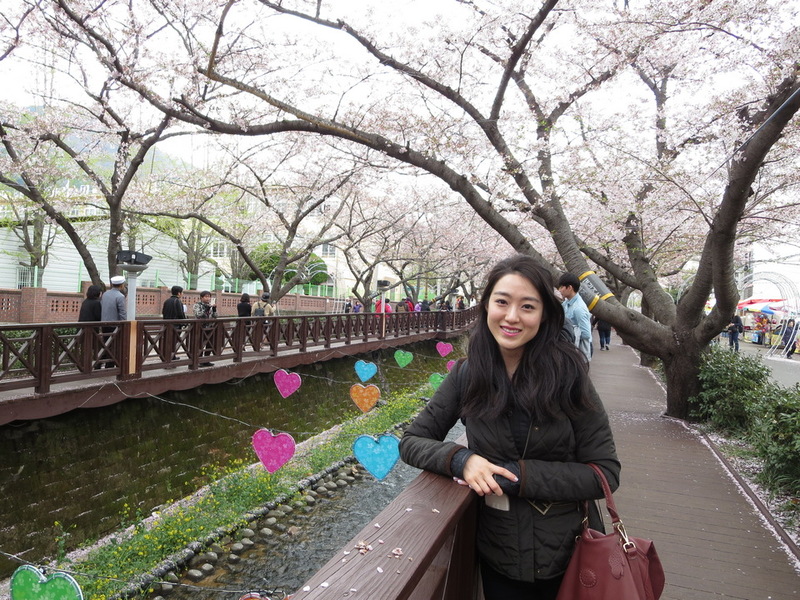 Cherry blossom in Jinhae. Credit: Cherry blossom festival Korea 2019 blog. 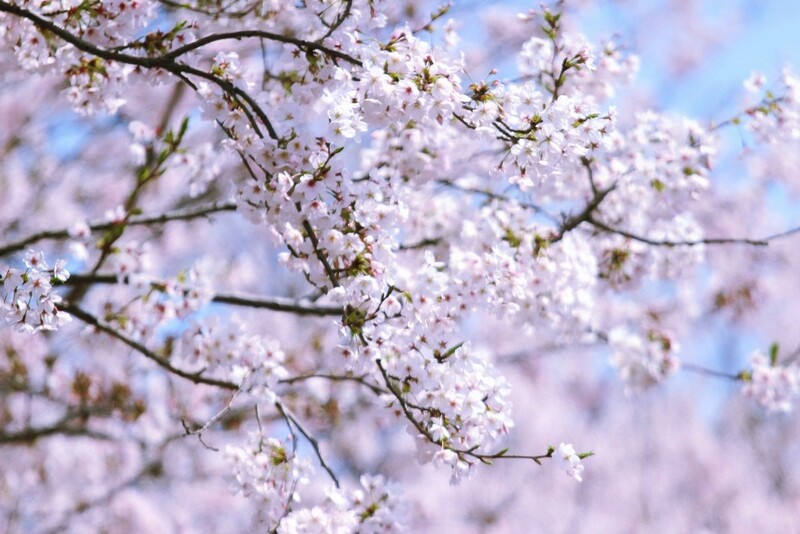 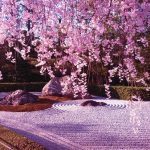 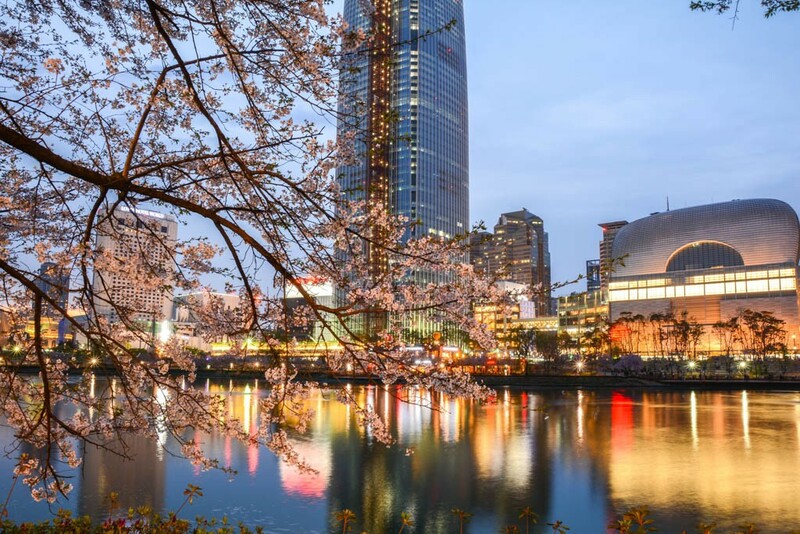 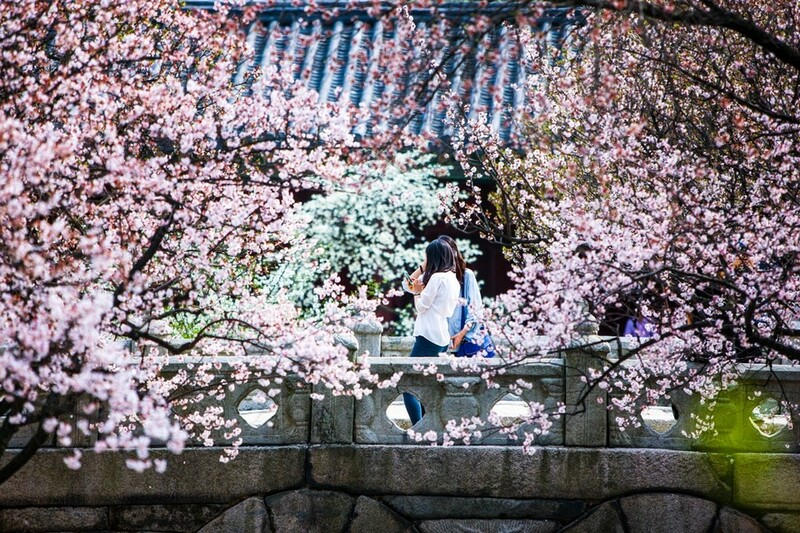 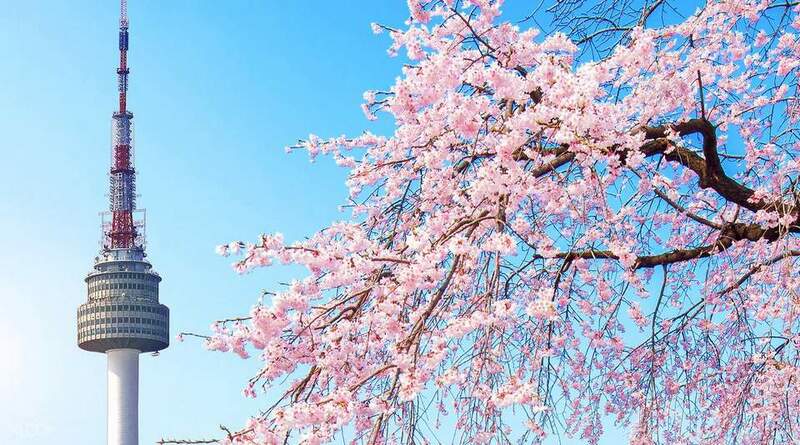 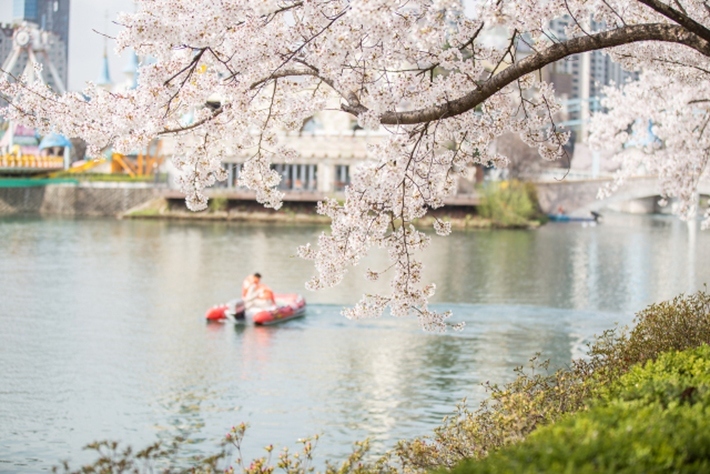 However, the cherry blossoms are not in full bloom for so long, it might take only from one to two weeks, so making a plan is everything to make sure you don’t miss out on such an amazing time of the year. 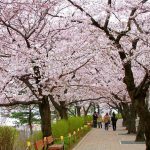 Check out on 2017 cherry forecast for South Korea to know the best time to visit South Korea for sakura season. 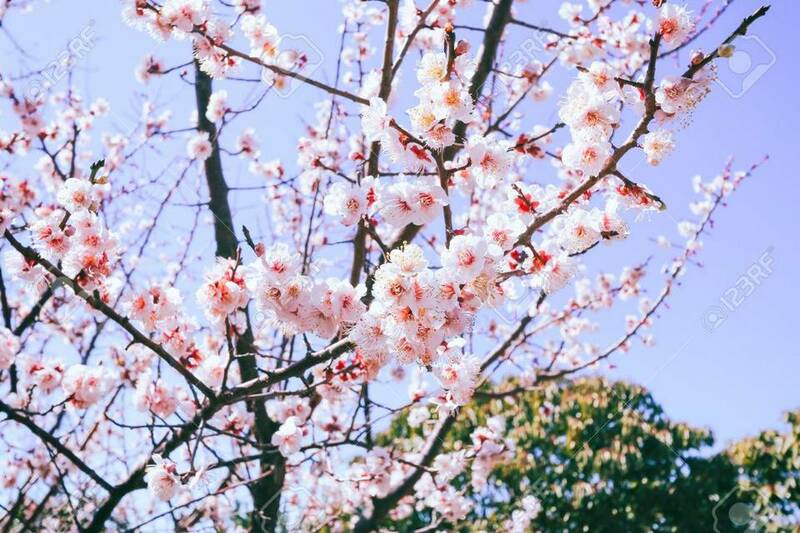 You can see the cherry blossoms for about a week from the date of full bloom. 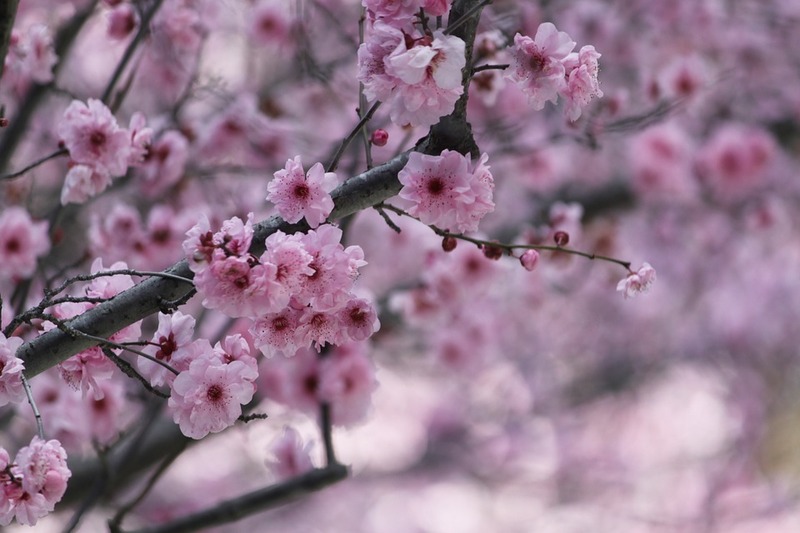 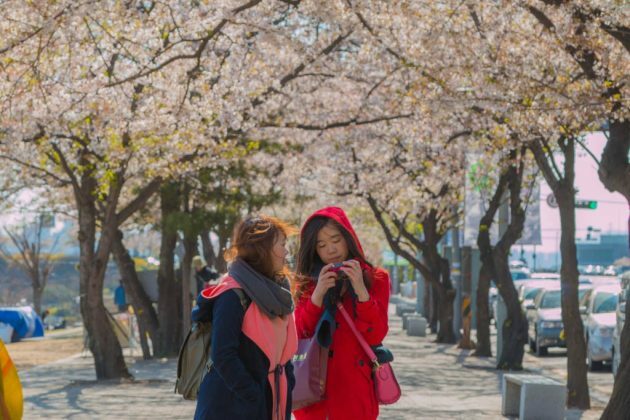 Cherry trees burst into bloom at different times at different region, but it usually blooms between late March to mid-April, take a look at the expected forecast will help you have an idea about your itinerary. 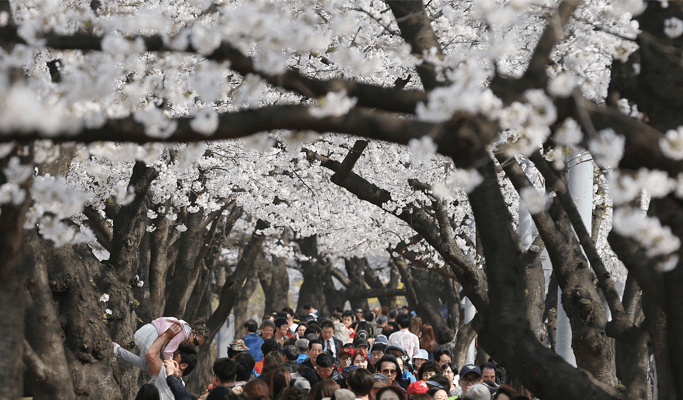 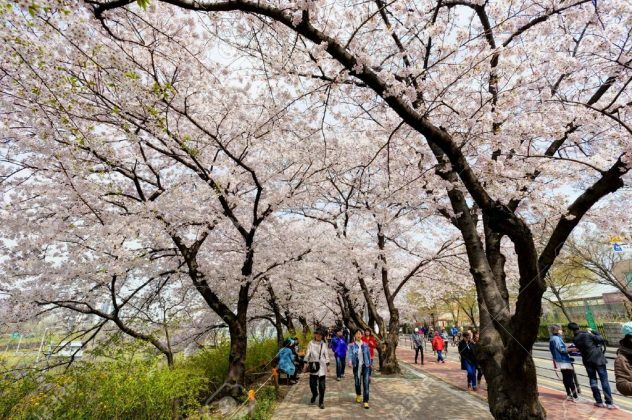 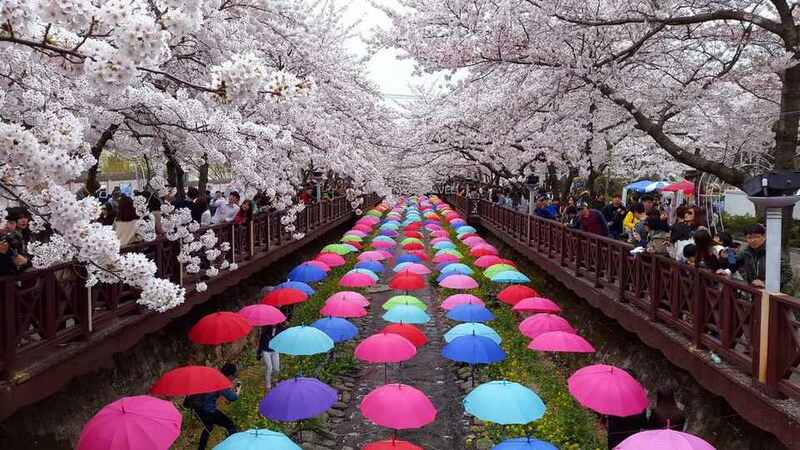 Read more: Cherry blossom in Korea 2019 forecast — The best time & Top 9 best places to see Cherry blossoms in Korea. 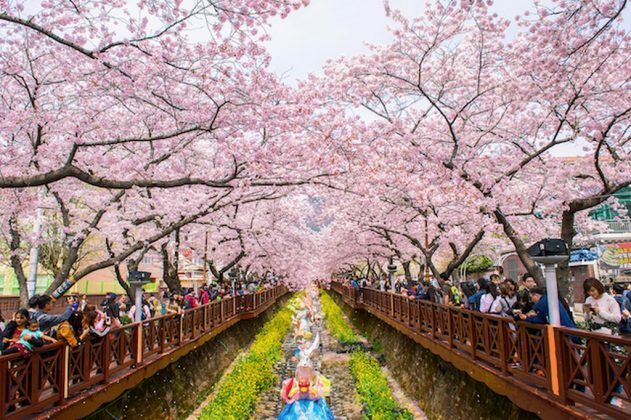 And here are the 5 best cherry blossom festivals that will take place in Korea in 2019 you should not be missed! 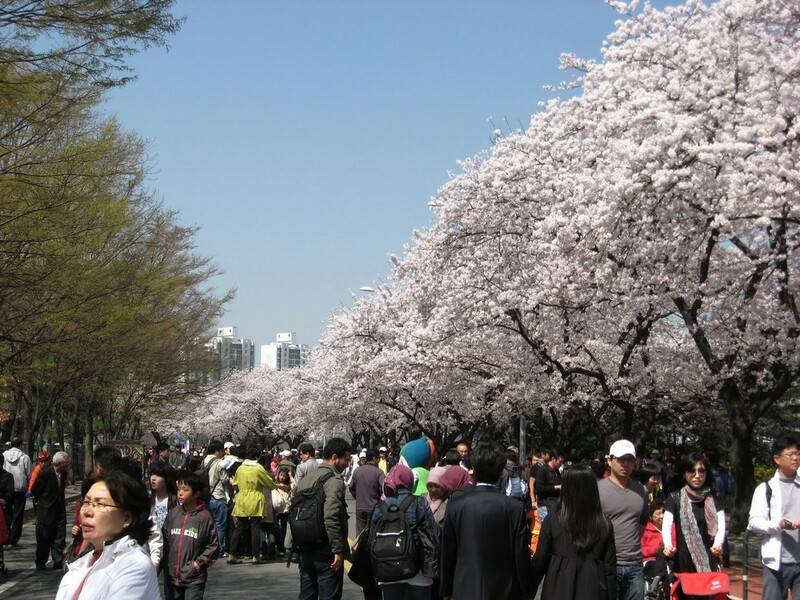 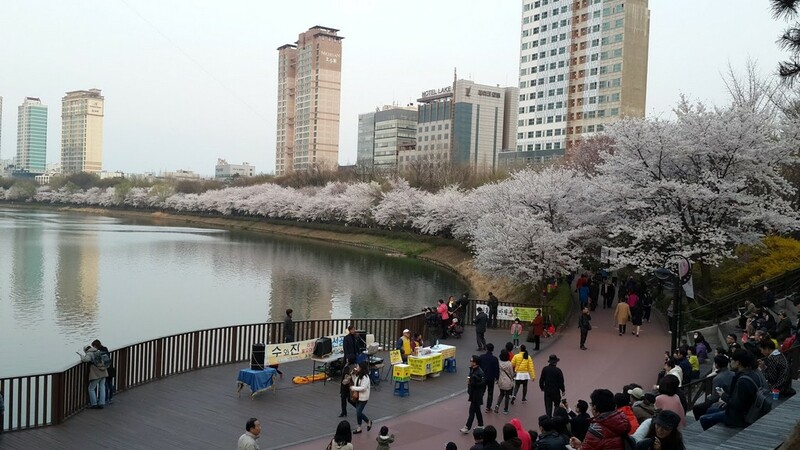 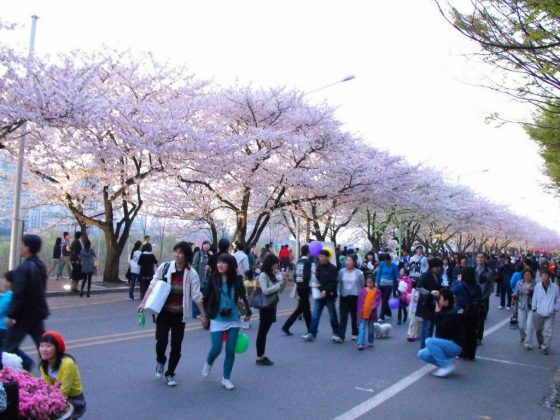 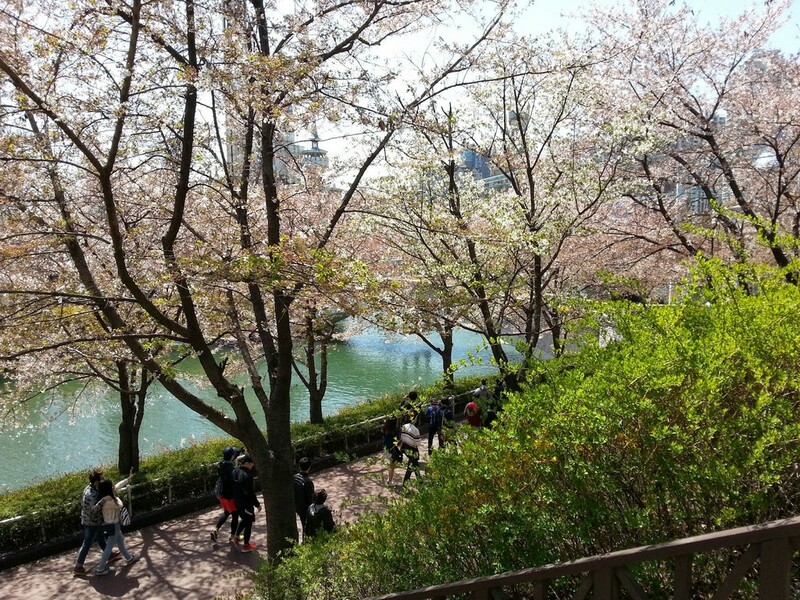 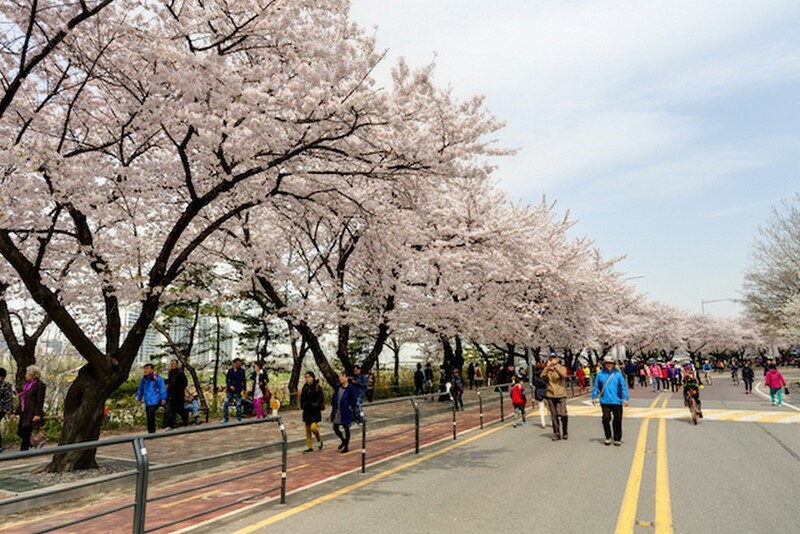 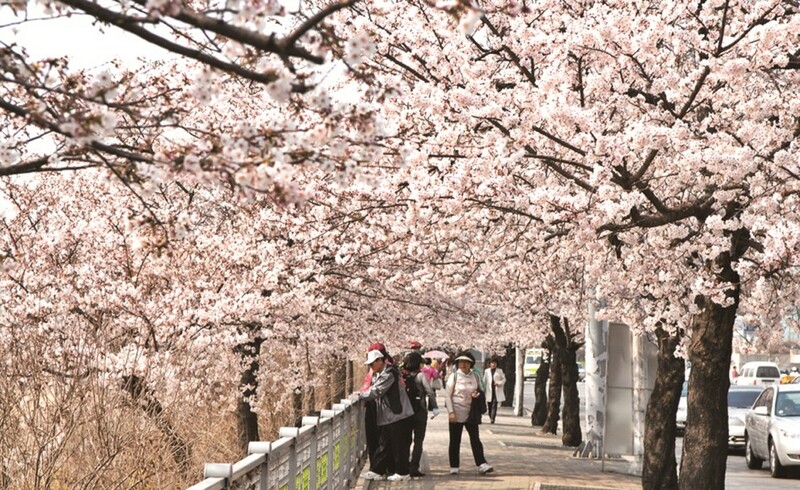 Yeouido Island is located right on the Han River is one of the most popular places to see sakura flower in Korea. With more than 1,600 cherry trees, this festival attracts hundreds of tourists and local alike each year. 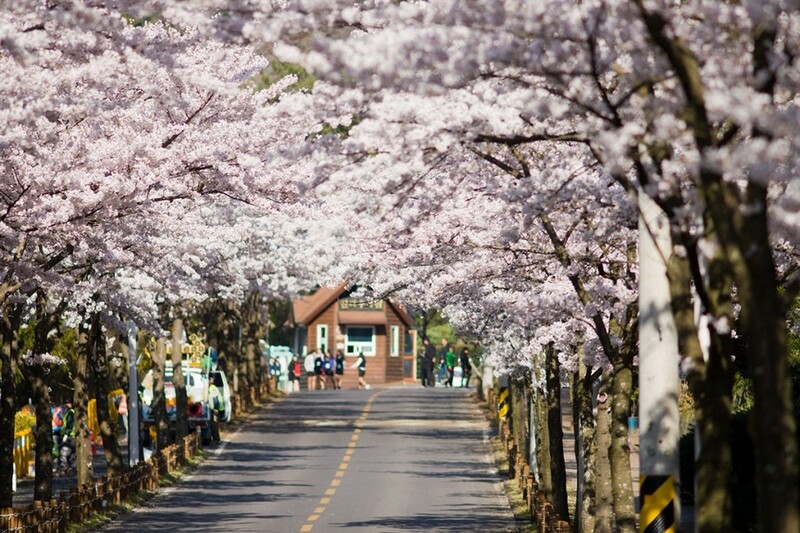 Especially, cars are restricted during the festival so you can take a stroll under romantic canopies of pink cherry trees. 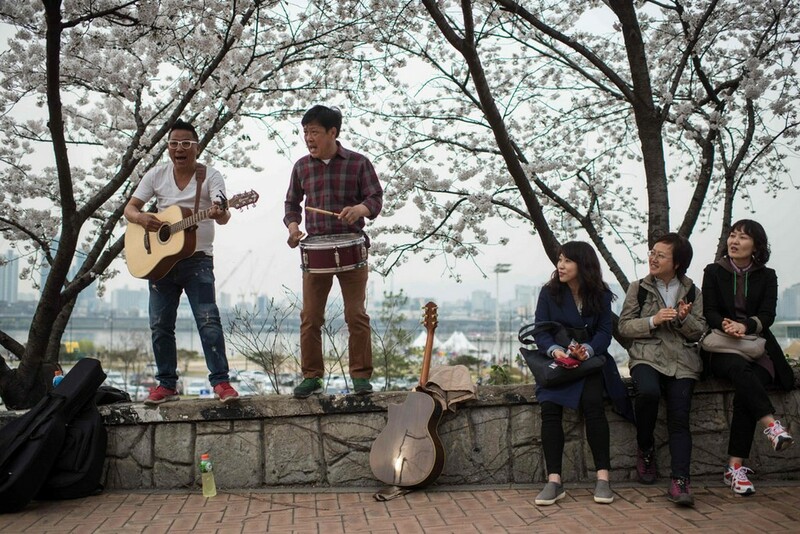 Besides, you can also get a chance to taste the yummy street food or join unique street performances. Credit: Cherry blossom festival Korea 2019 blog. 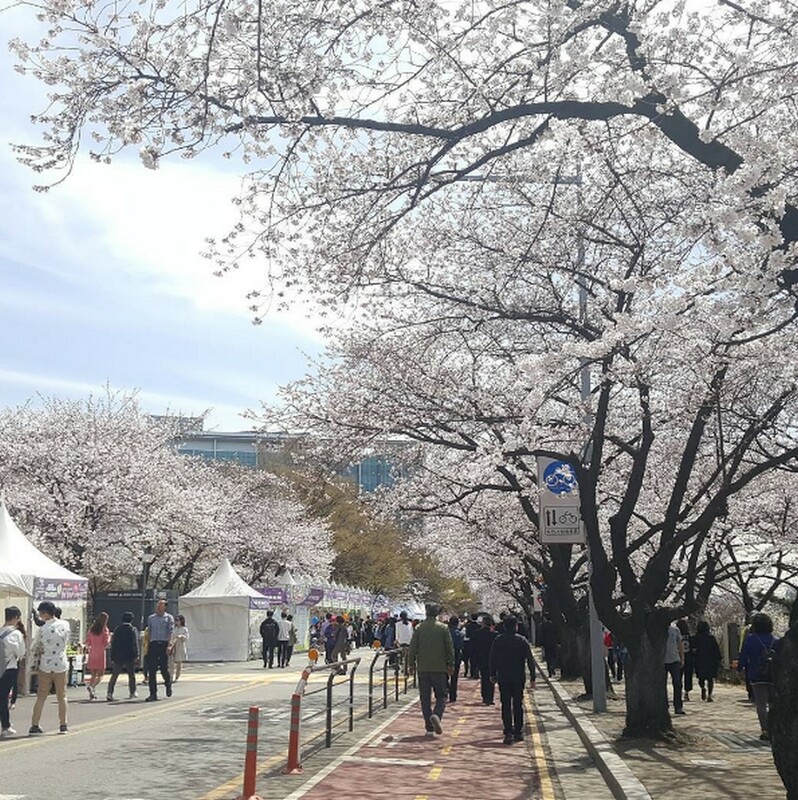 Picture: seoul cherry blossom 2019 blog. 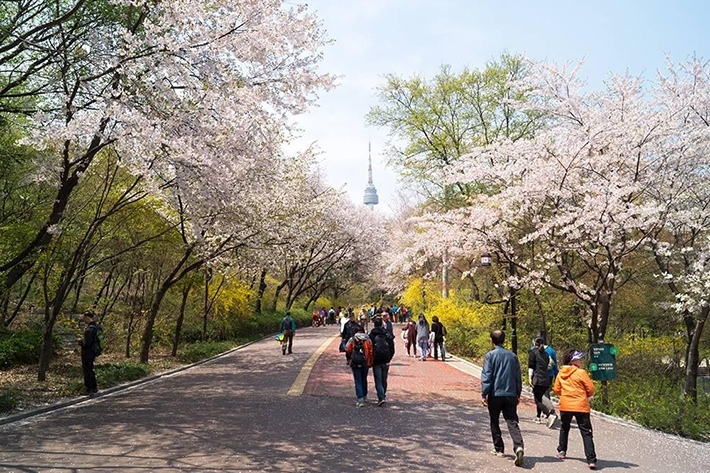 How to get: Take Seoul Subway Line 5 to Yeouinaru Station (Exit 1), or Subway Line 9 to National Assembly Station (Exit 6). 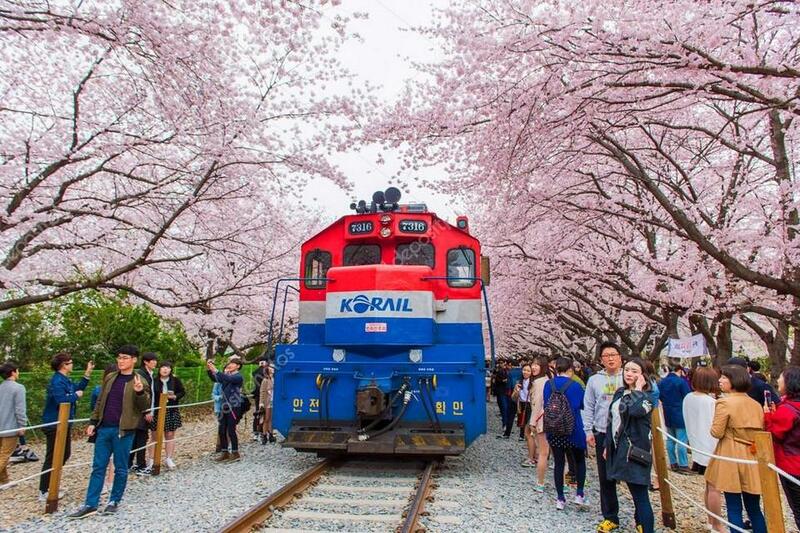 Basic fare is $1.50 (KRW 1,350) for adults and $0.50 (KRW 450) for children. 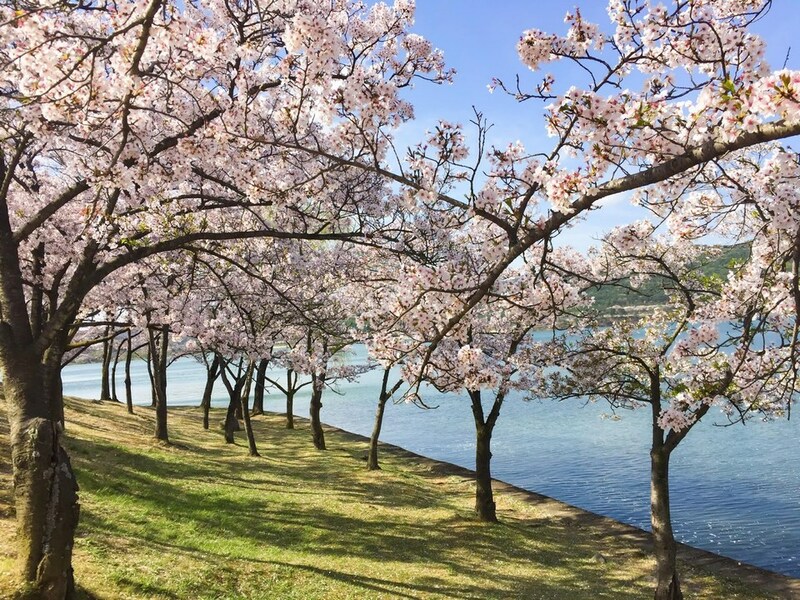 As one of the largest artificial lake of South Korea with the area of 147.400m², Seokchon Lake is the ideal place to fully enjoy the atmosphere of South Korean spring with rows of cherry blossom trees. 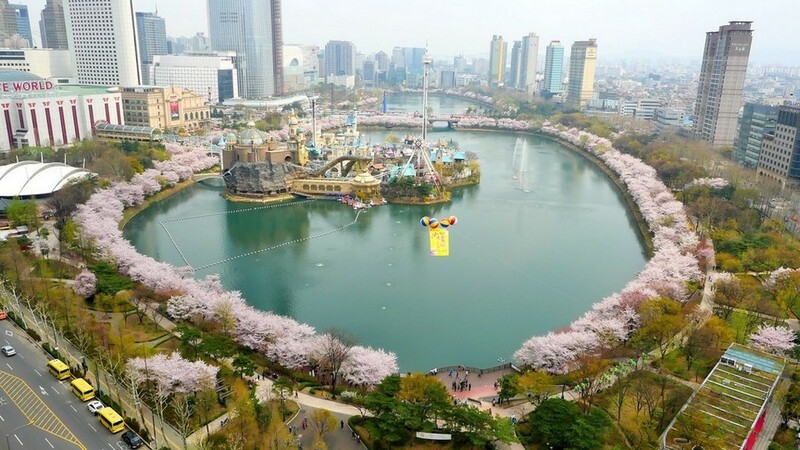 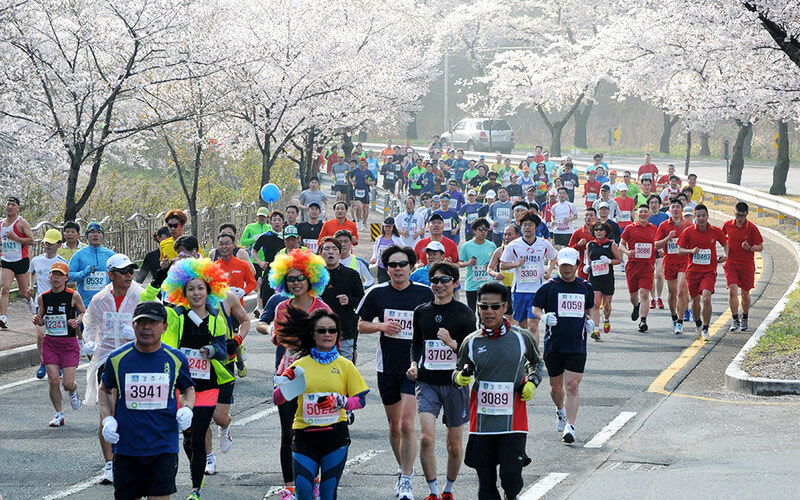 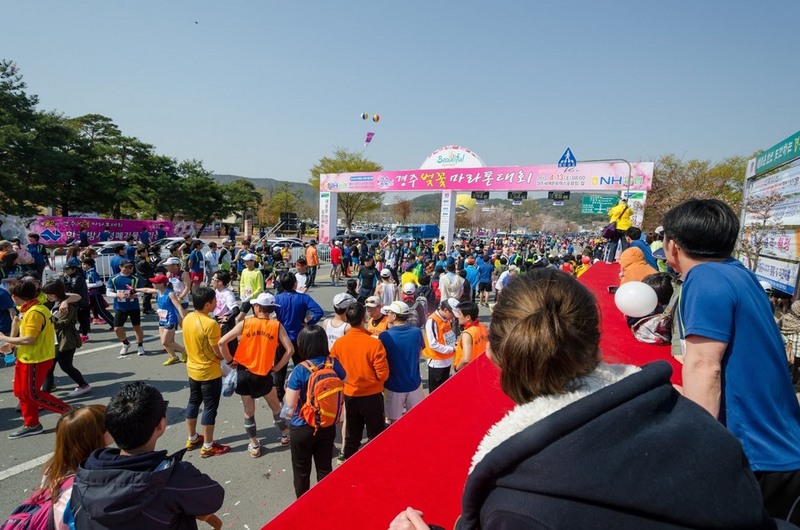 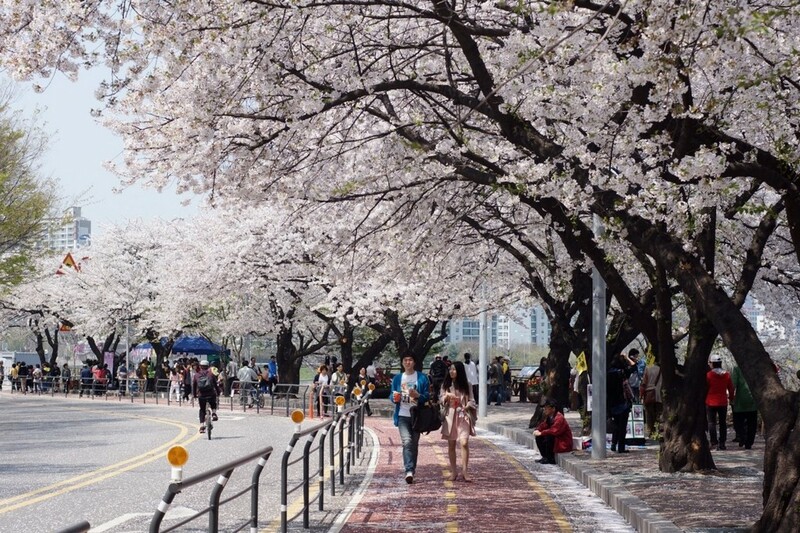 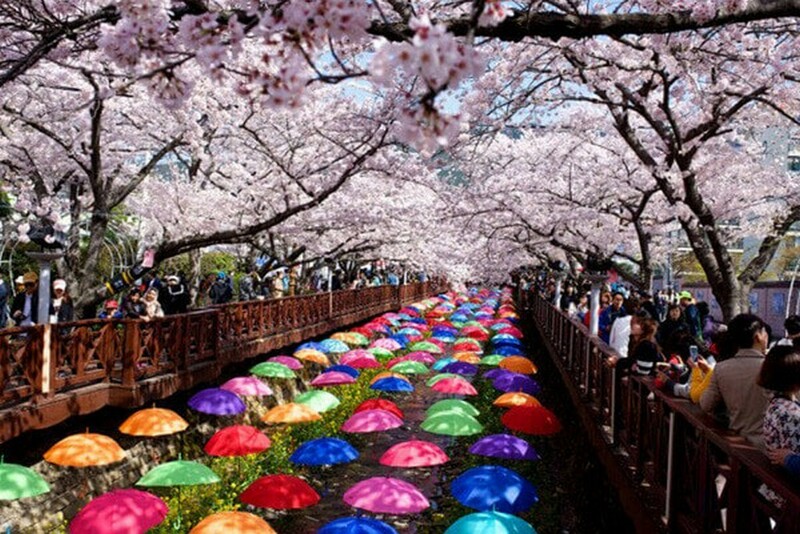 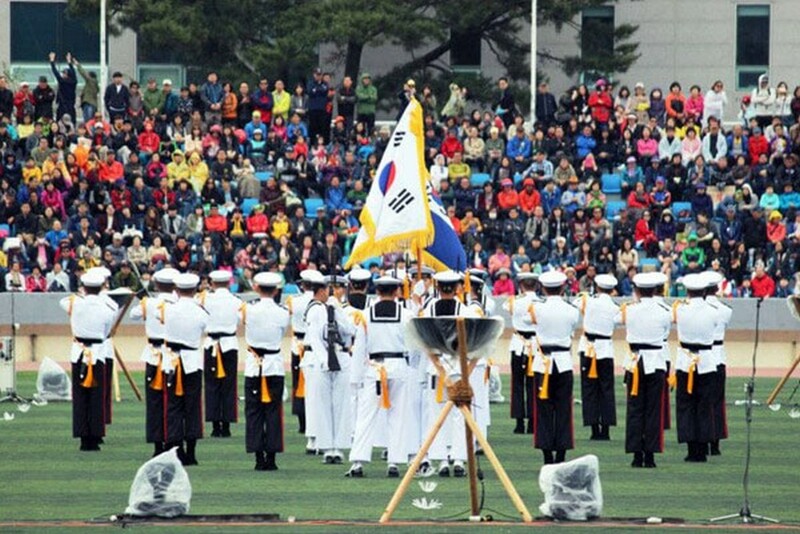 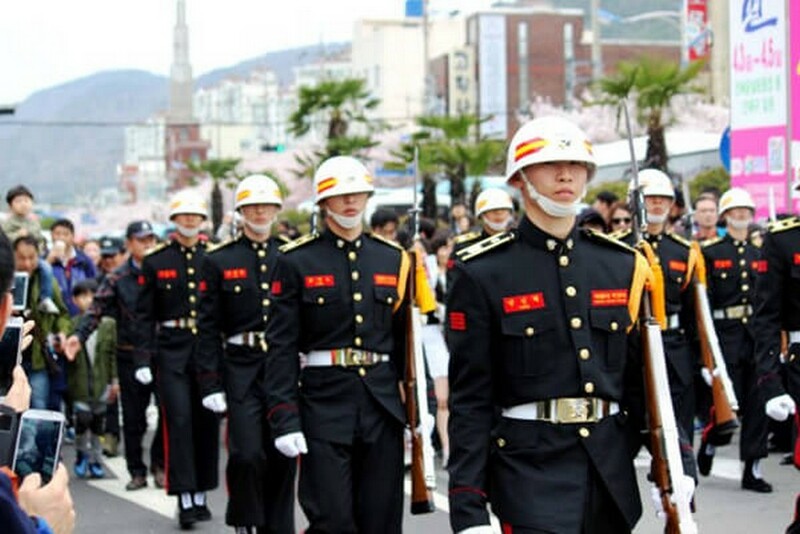 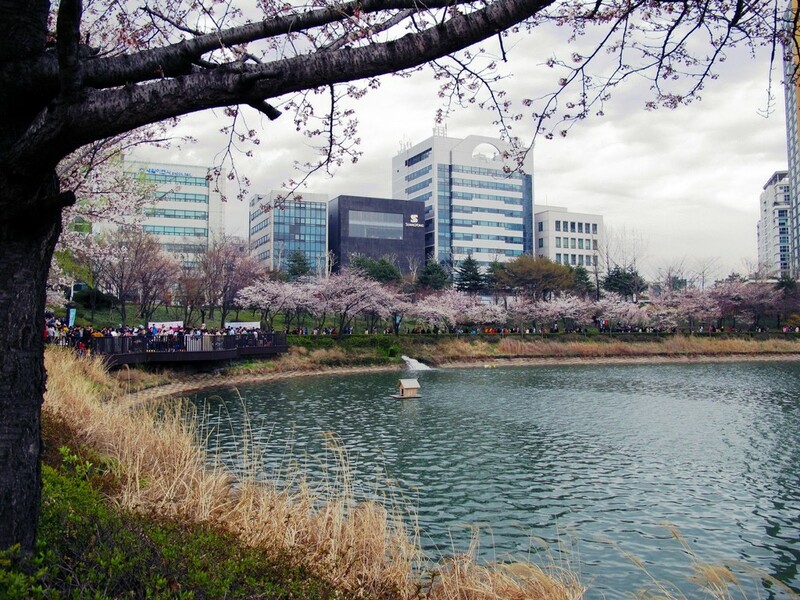 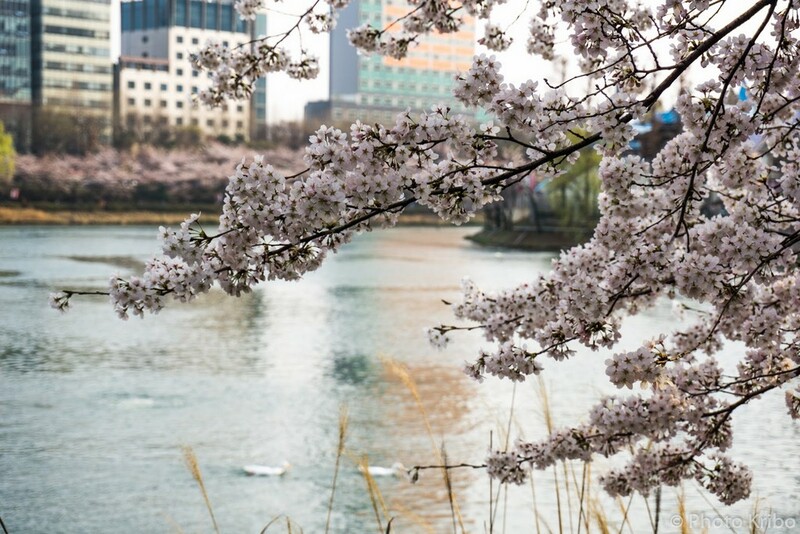 During the Seokchon Lake cherry blossom festival, there are many cultural activities, performances and exhibitions will take place along the roads. 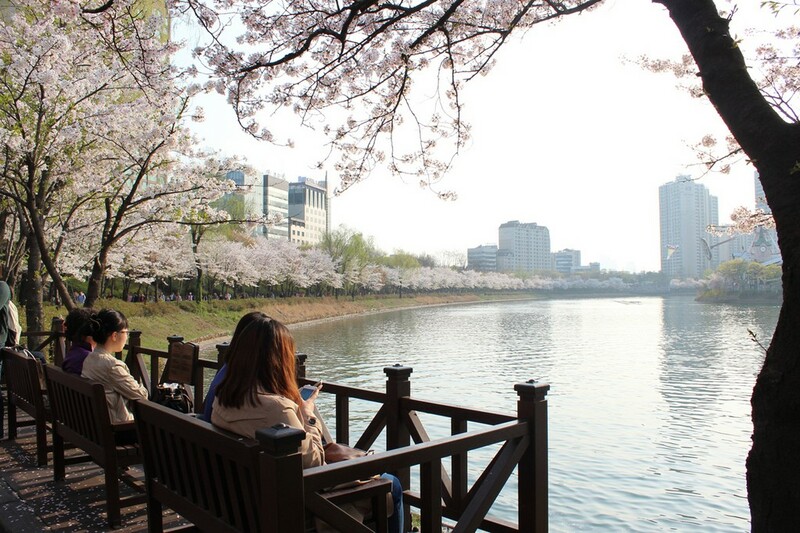 Don’t miss a chance to visit Seokchon Lake to have a deeper insight into South Korean’s culture. 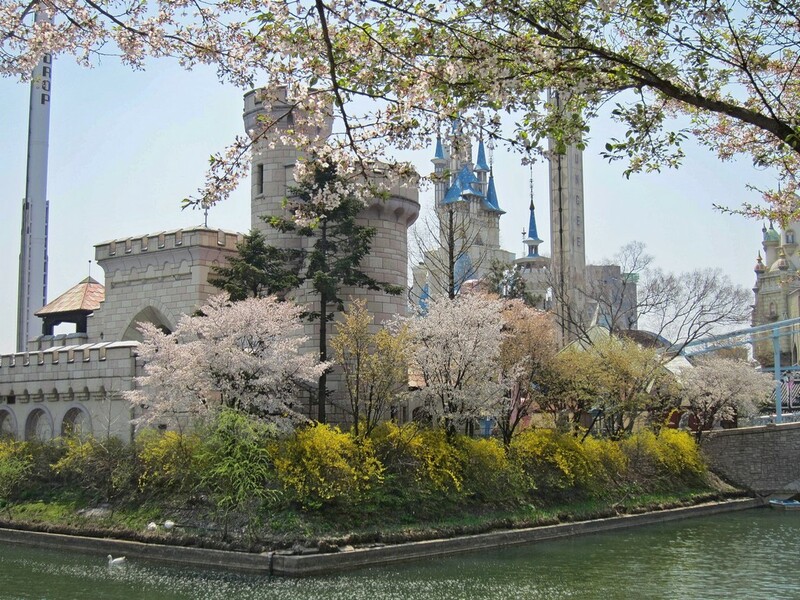 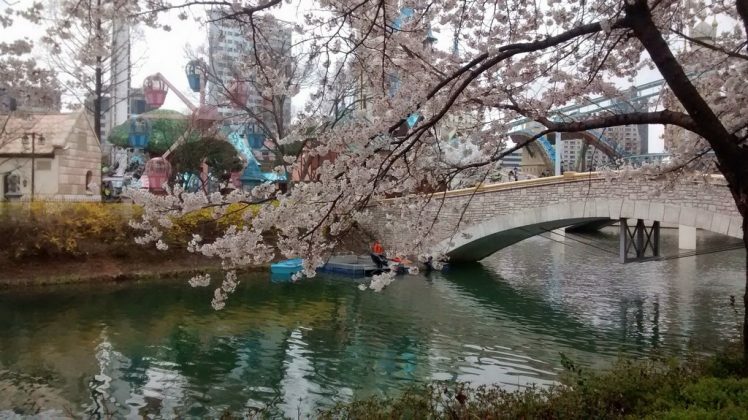 What is more, Lotte World amusement park is located right next to the lake for entertainment or sightseeing. 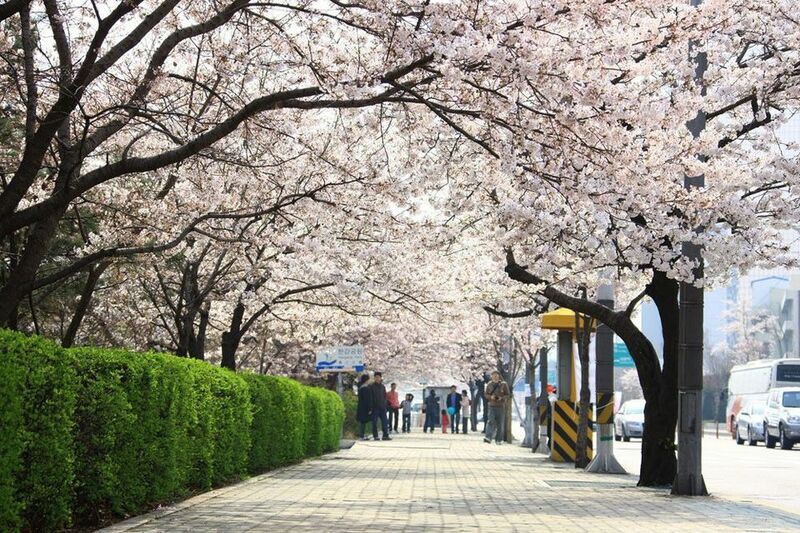 How to get: Take Seoul Subway Line 2 to Jamsil Station (Exit 2). 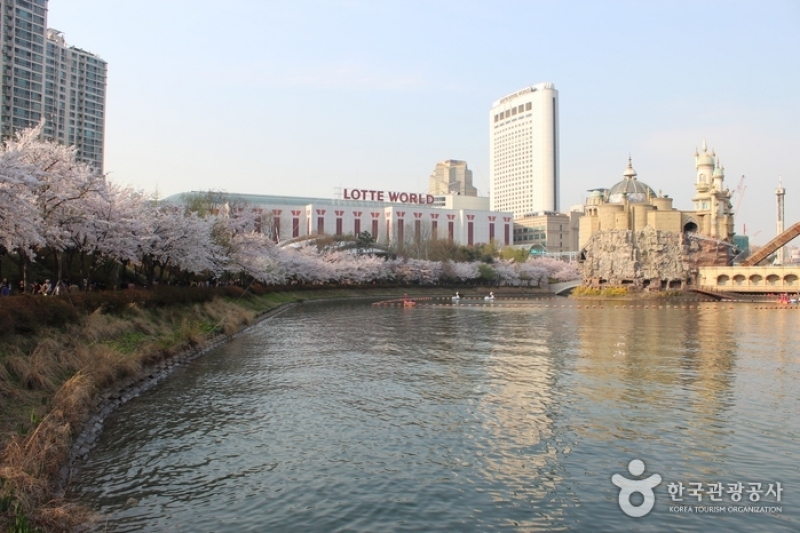 Basic fare is $1.50 (KRW 1,350) for adults and $0.50 (KRW 450) for children. Only an hour drive from Busan, Jinhae is home to the largest cherry blossom festivals of South Korea, attracts millions of people each year. The festival lasts for 10 days from April 1st to 10th with many exciting activities such as art performances, street parade. 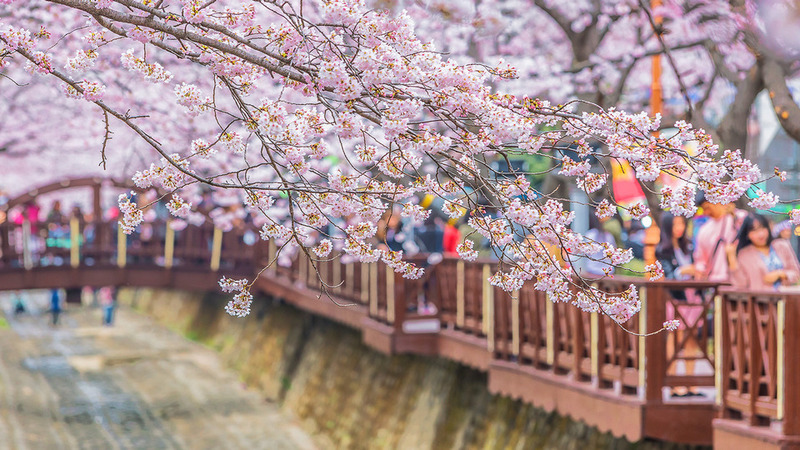 Don’t miss the Romance Bridge here as this bridge is well known as the shooting location for the Korean drama named “Romance”. 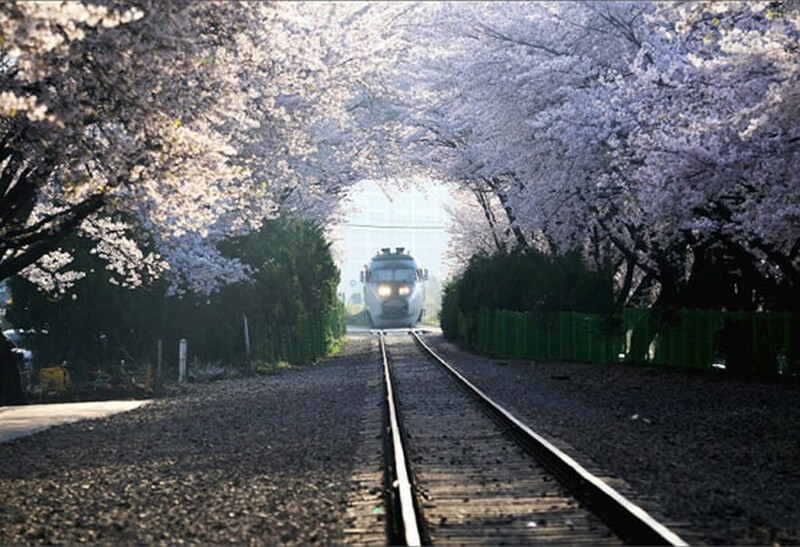 Gyeonghwa train station is also a perfect spot to take stunning photos. 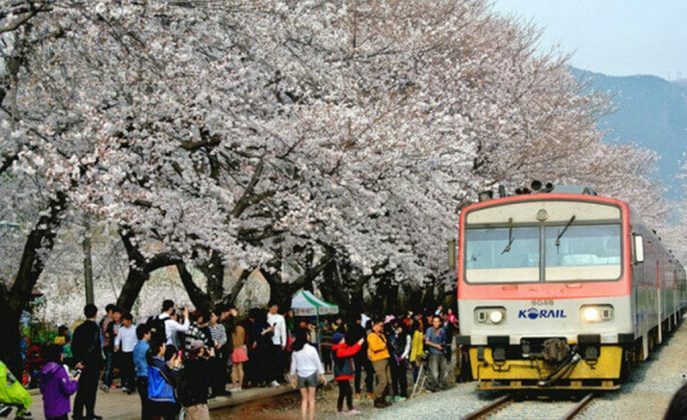 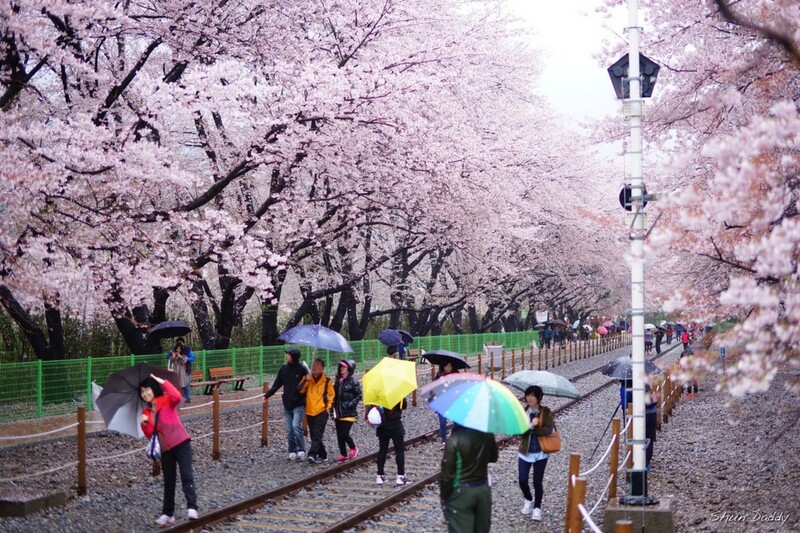 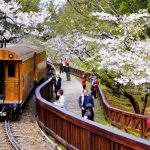 The train runs only during the 10-day festival, take a train here to see cherry blossoms is definitely a must-do in South Korea. 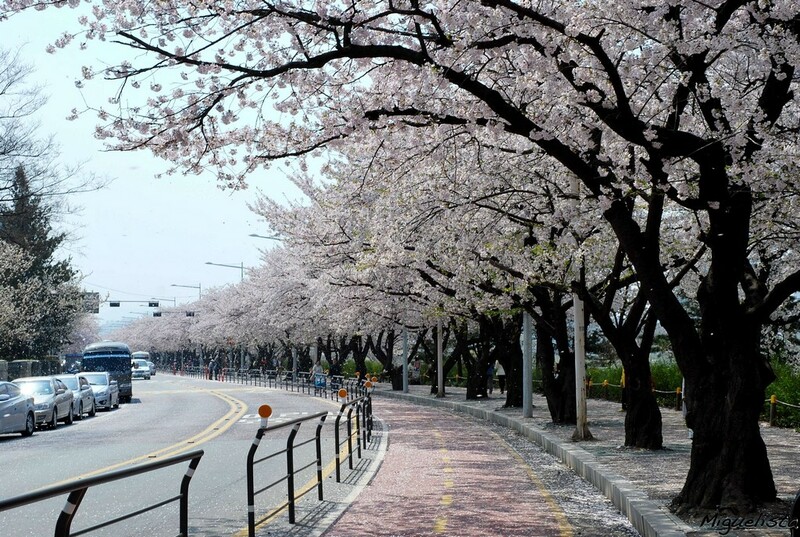 How to get: Take a bus from Seobu Terminal in Busan. 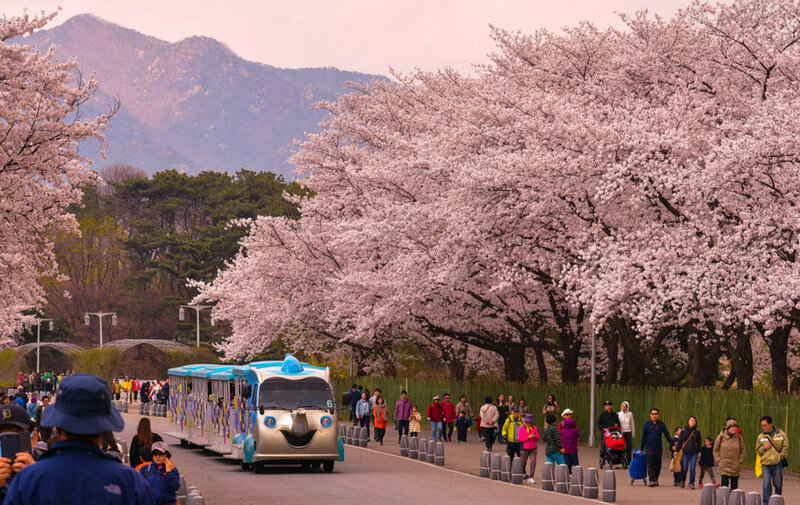 The bus ride from Busan to Jinhae is 45 min to 1 hour and costs $6 (KRW 5,100) for a one-way trip. Gyeongju is favored by many foreigners as there are so many historical sites and stunning natural landscapes in Gyeongju. 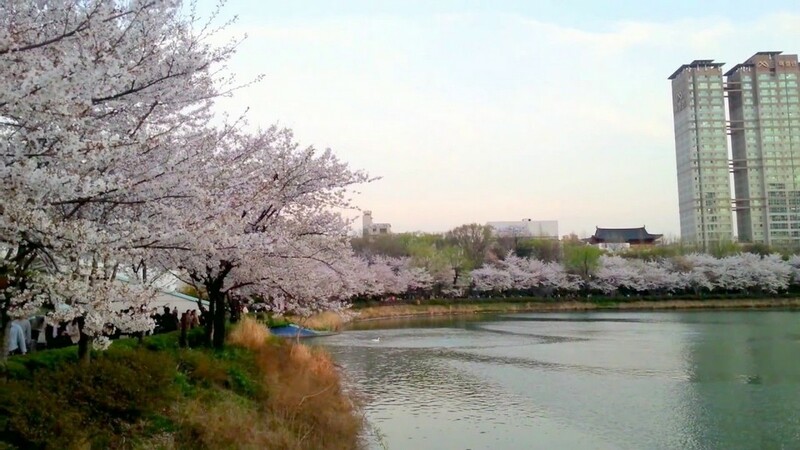 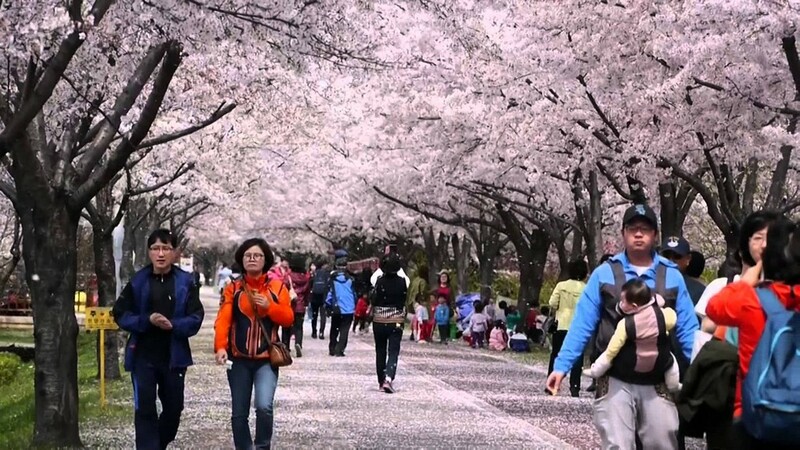 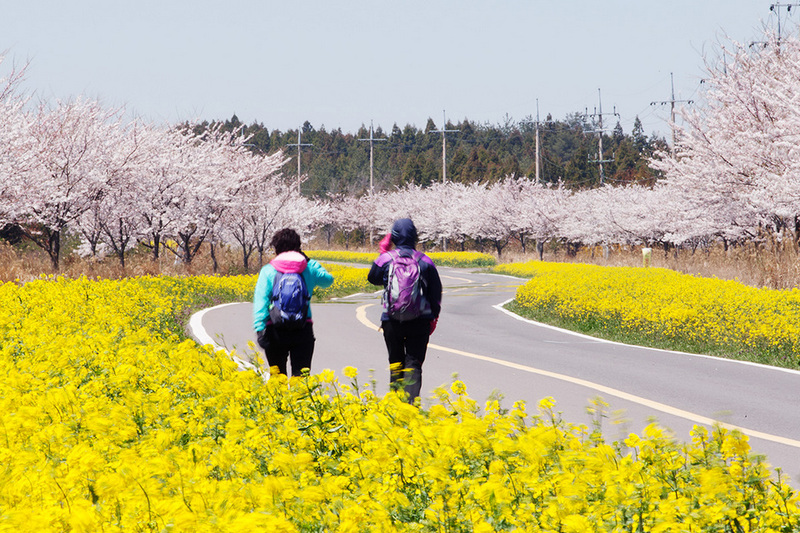 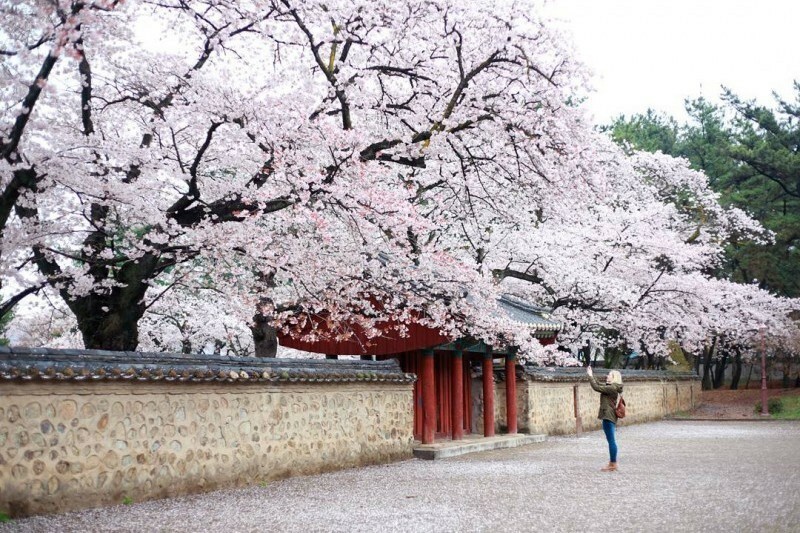 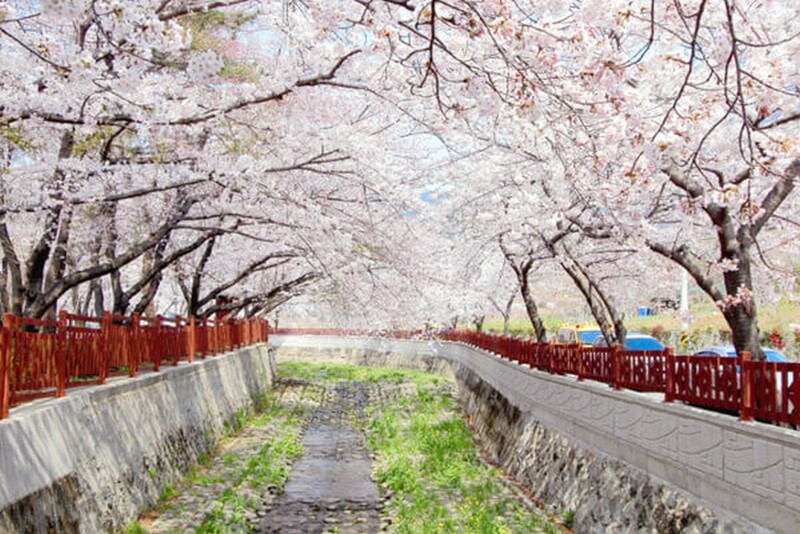 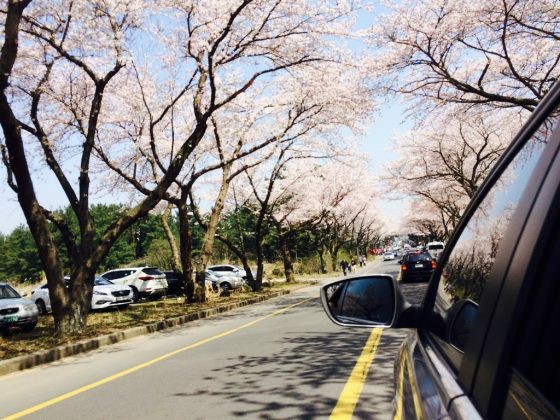 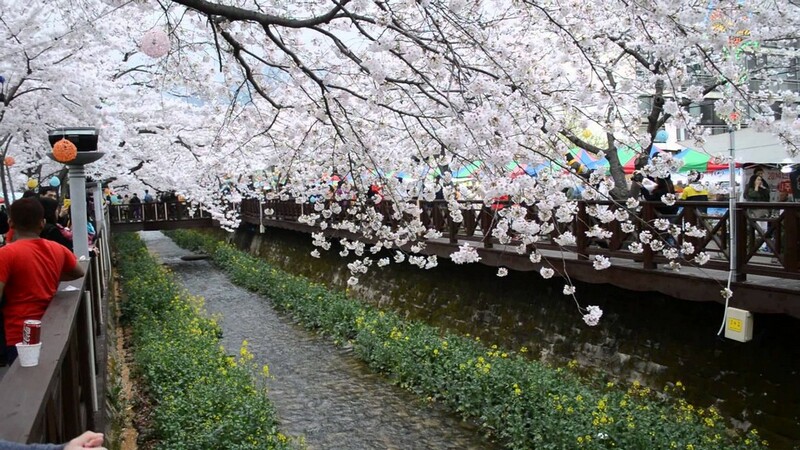 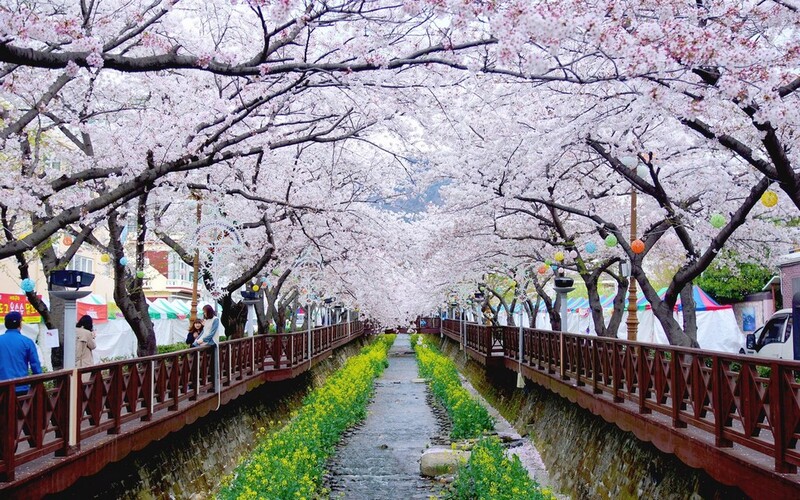 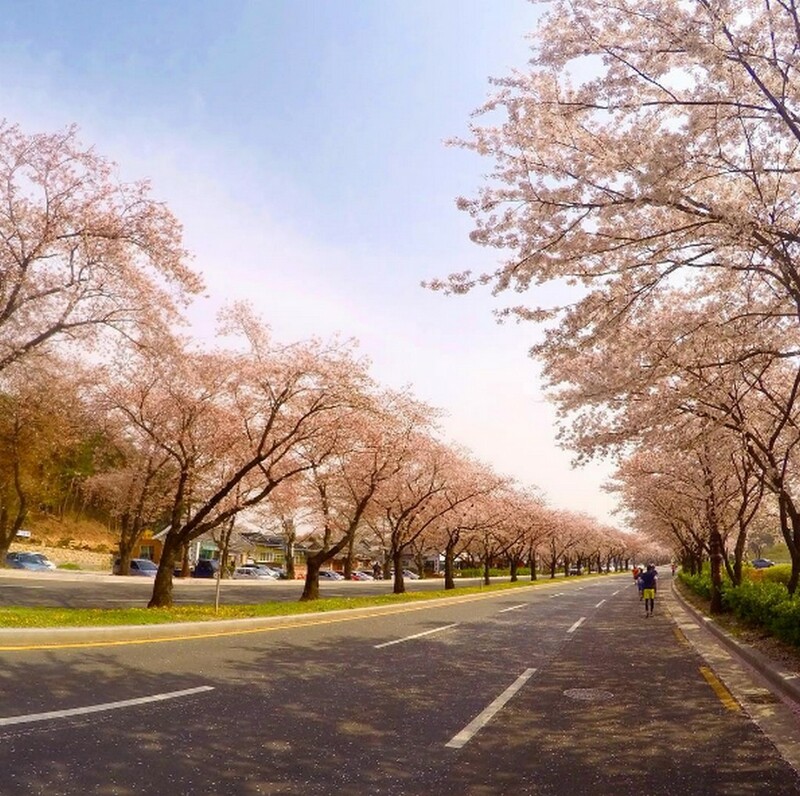 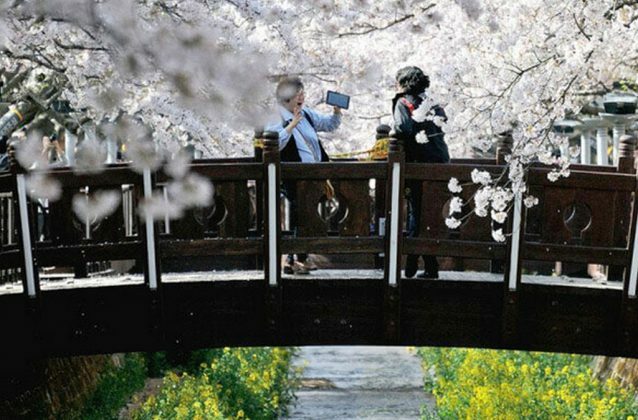 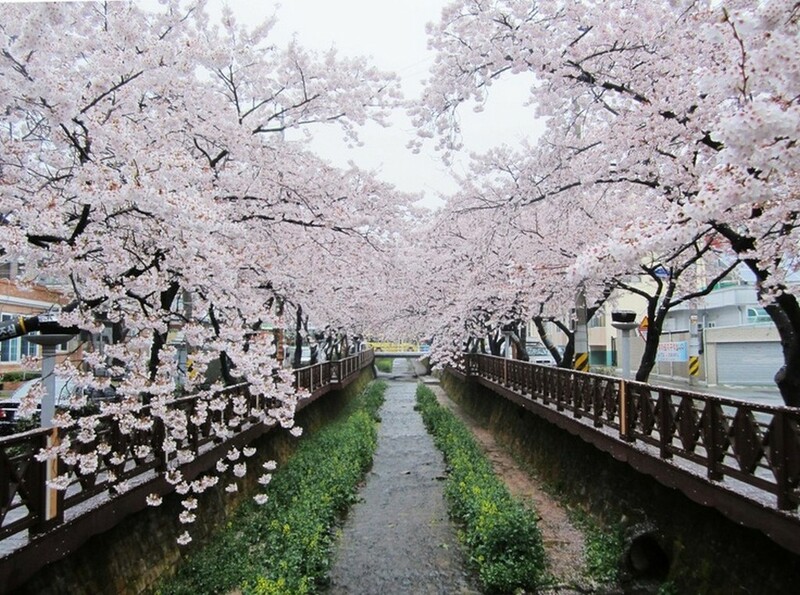 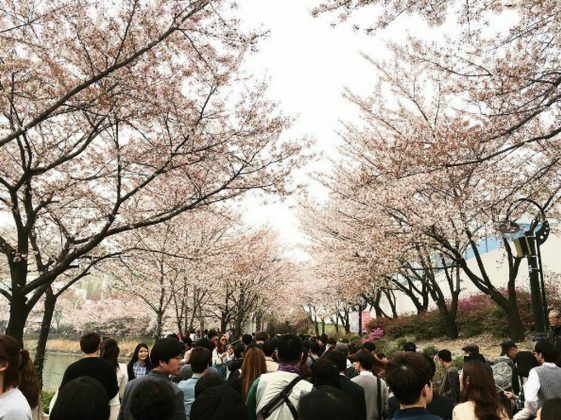 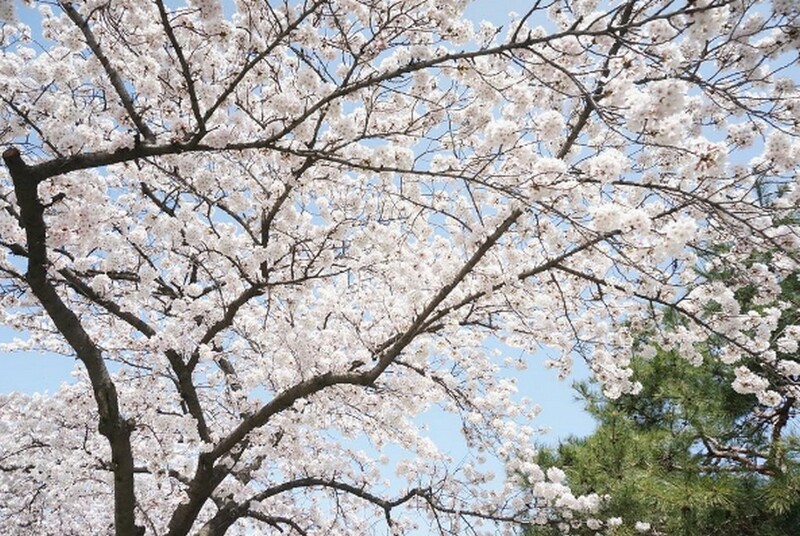 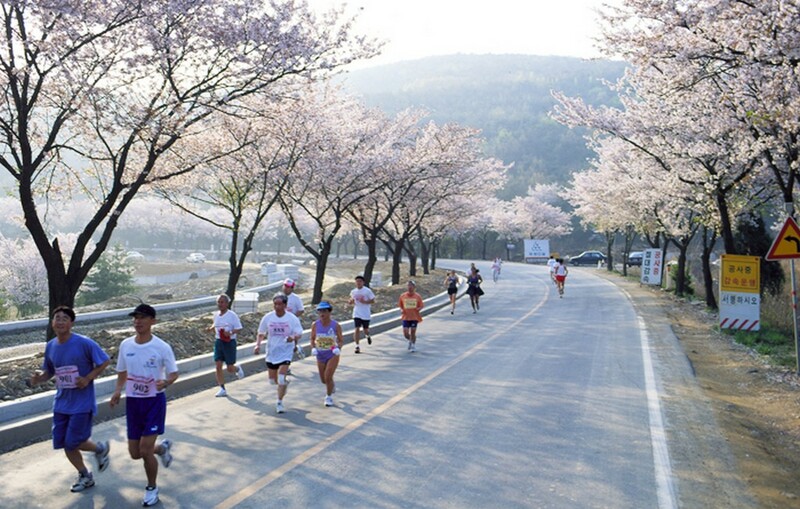 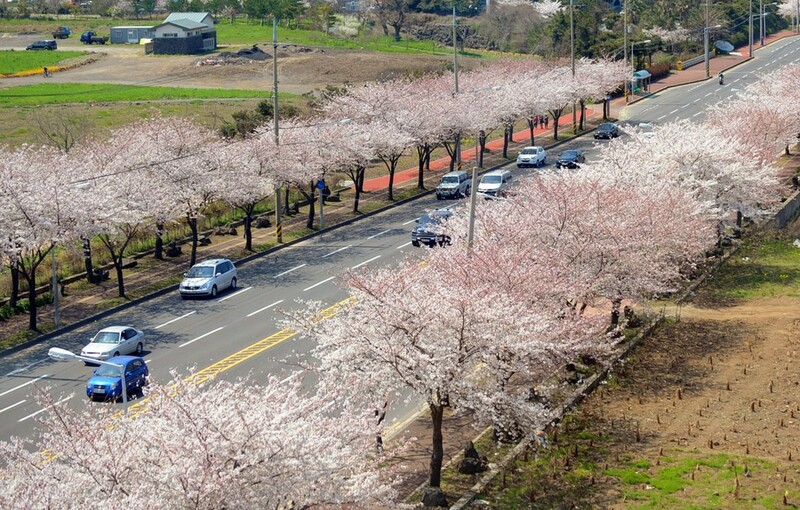 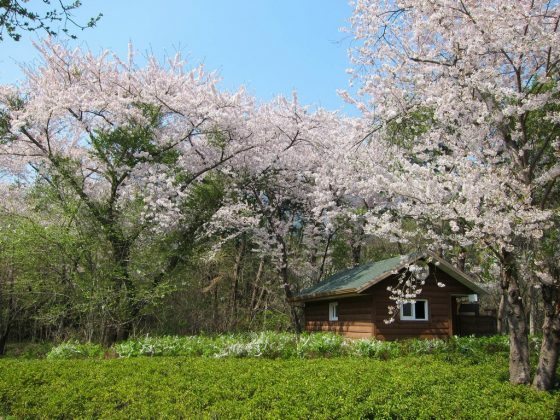 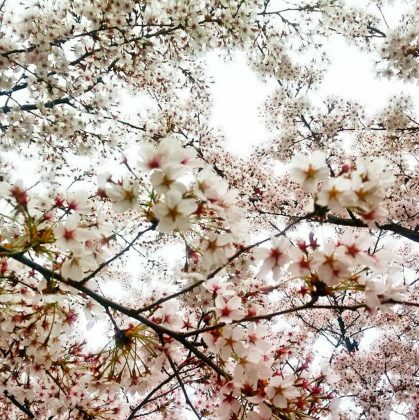 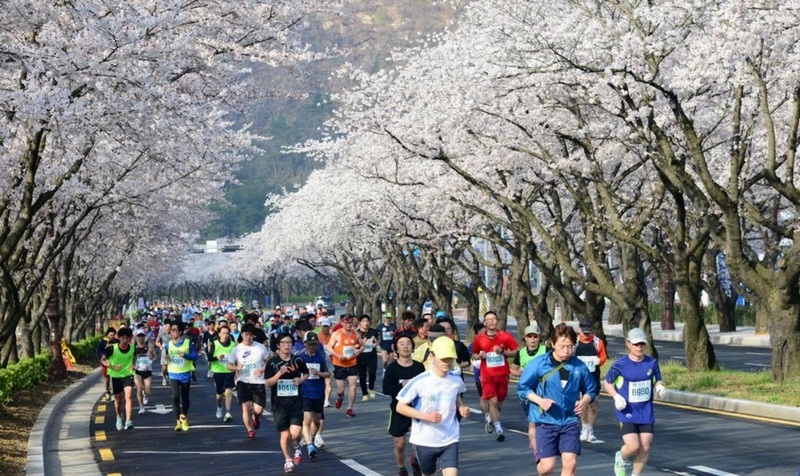 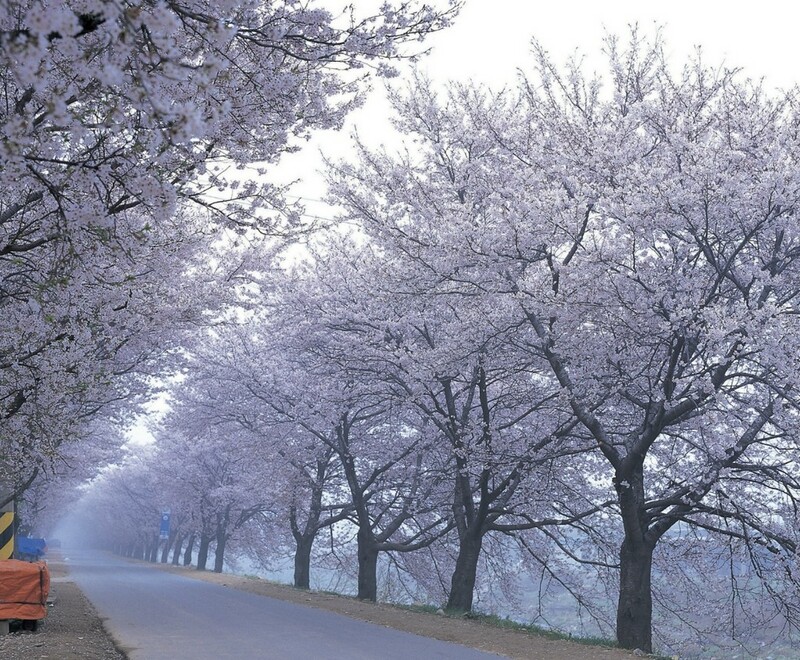 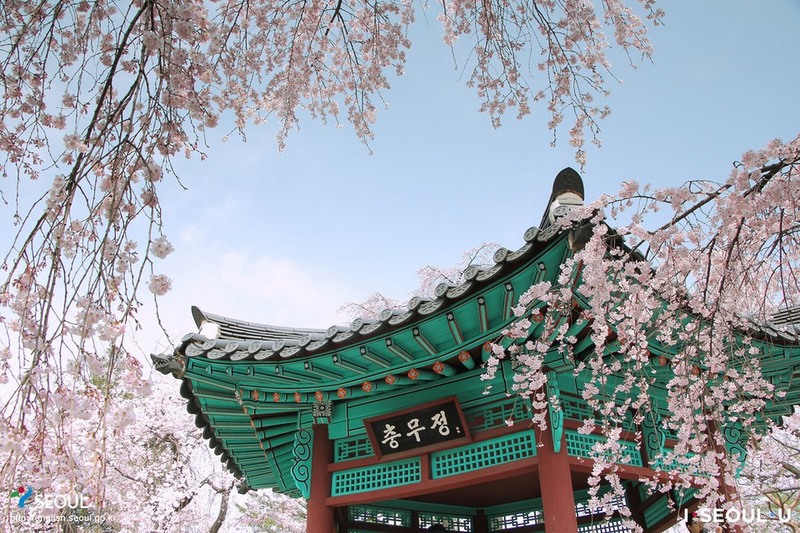 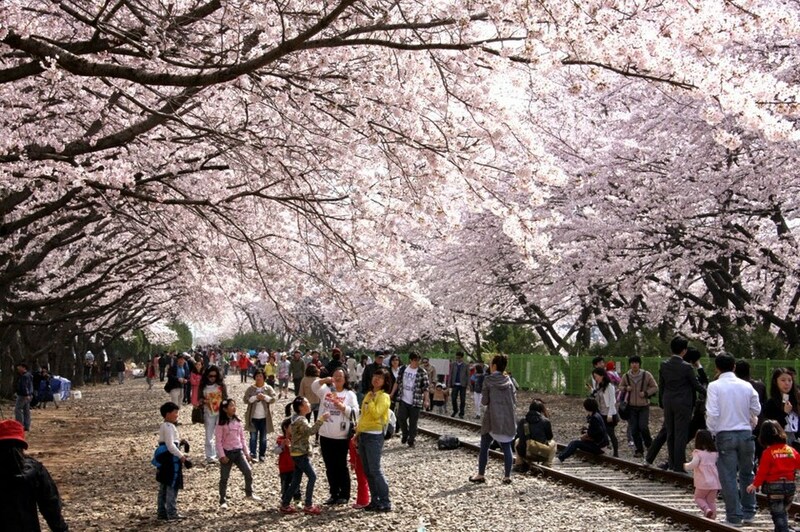 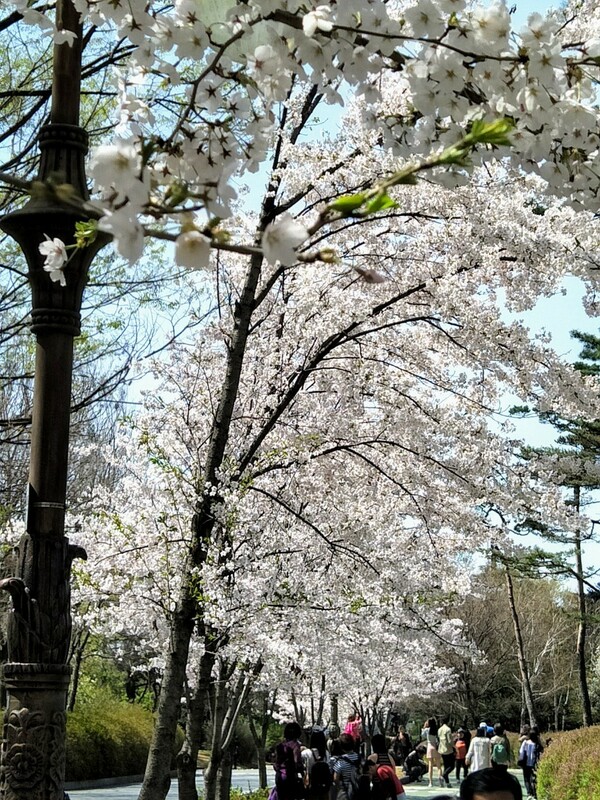 In cherry flowers season, Gyeongju is even more attractive with white and pink petals fill the air, especially Cheomseongdae observatory area to the Heungmu Park. 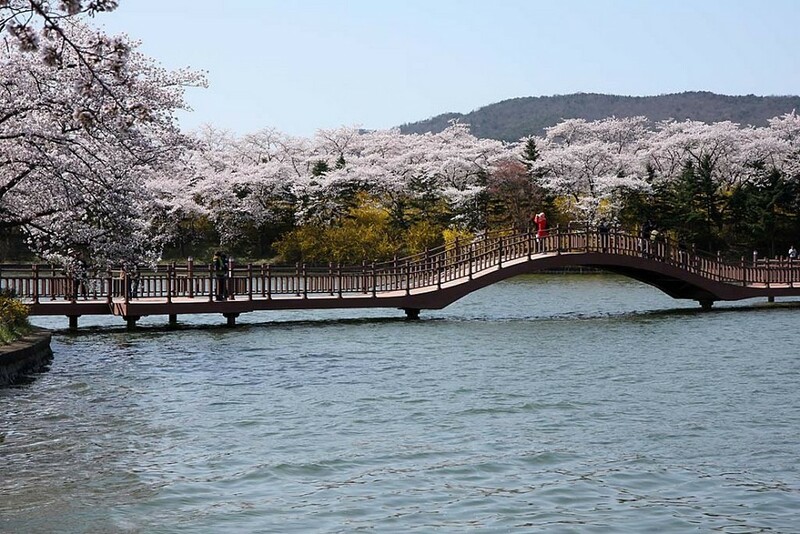 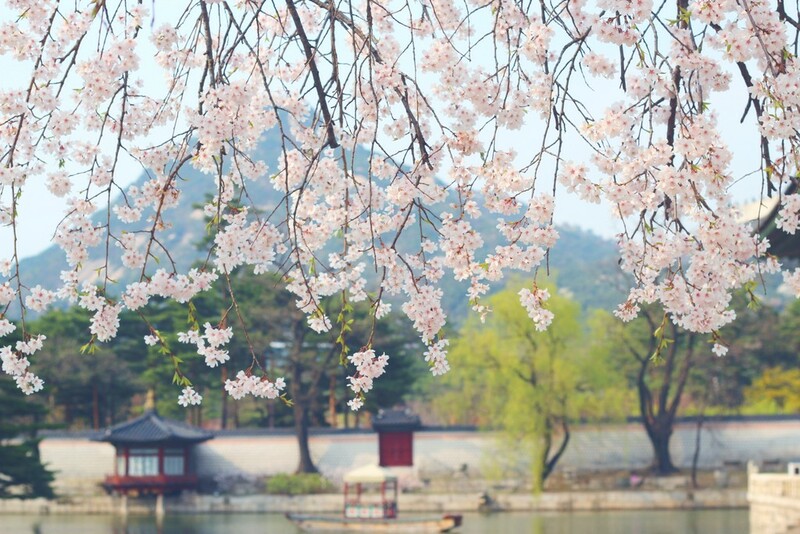 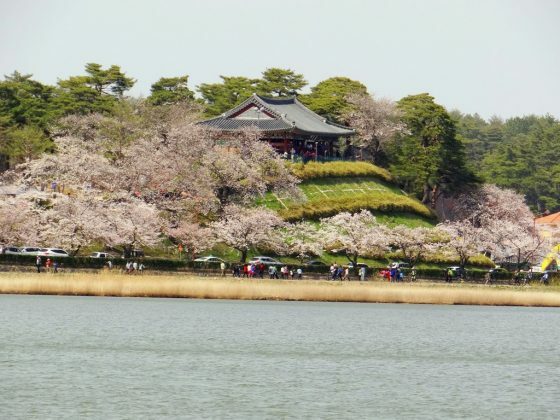 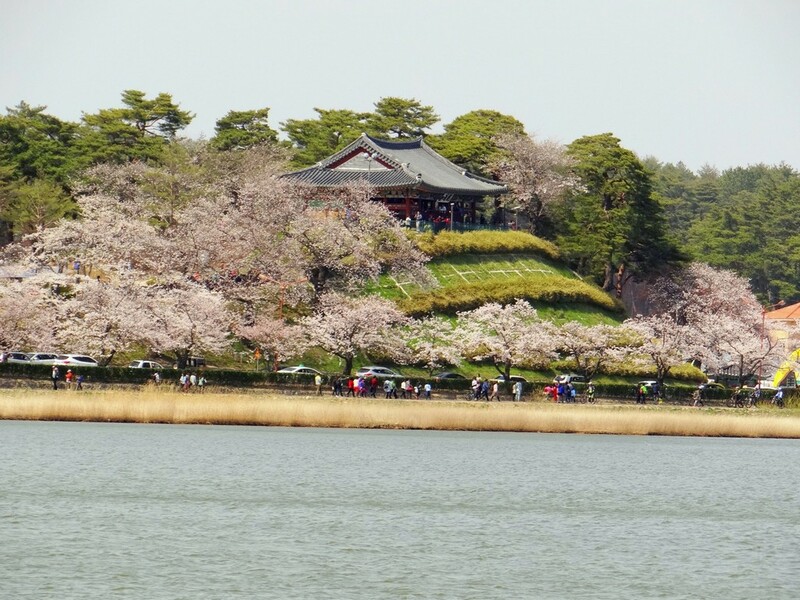 One of the peach blossom viewing sites in Gyeongju favored by tourists and photographers is Bomun gazebo – a small wooden gazebo by the peaceful lake Bomun. 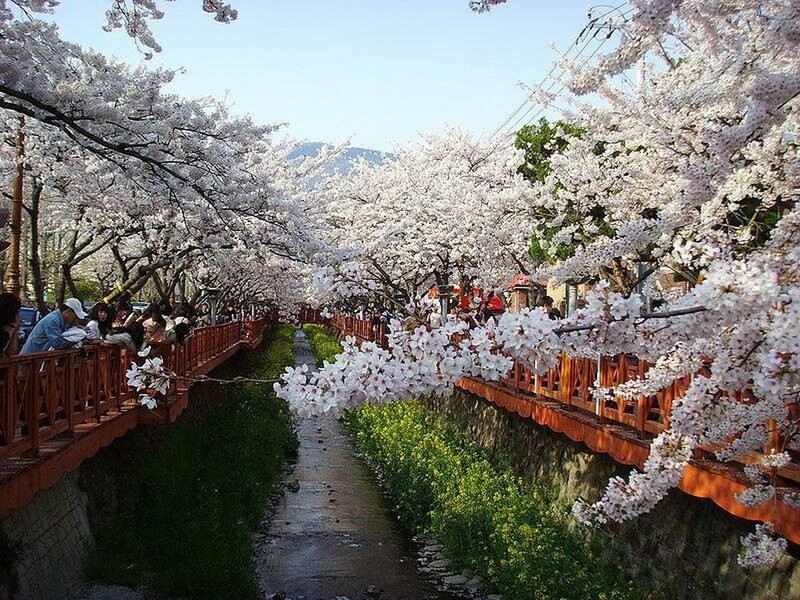 Seokguram Grotto in Bulguksa Temple Anapji is recommended to be visited at night because of the breathtaking view. 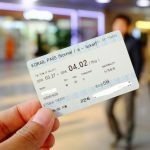 How to get: Take an express bus from Busan Central Bus Terminal. 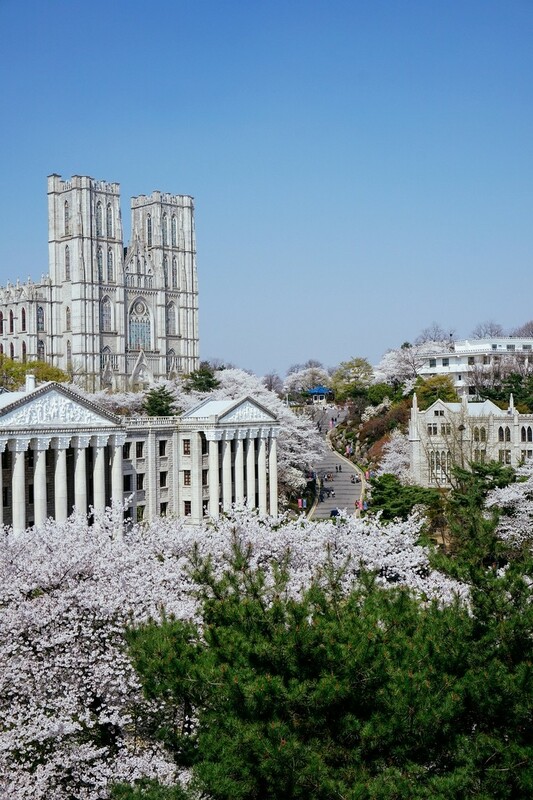 It takes about 50 minutes Busan to Gyeongju by bus and costs $5.50 (KRW 4,800) for a one-way trip. 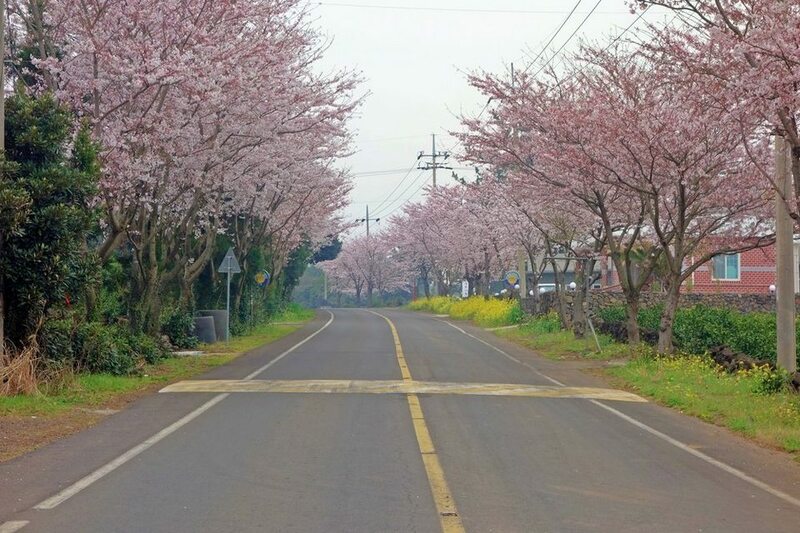 Jeju island is always a peaceful and fascinating place in springtime, especially when the cherry flowers burst into gorgeous bloom. 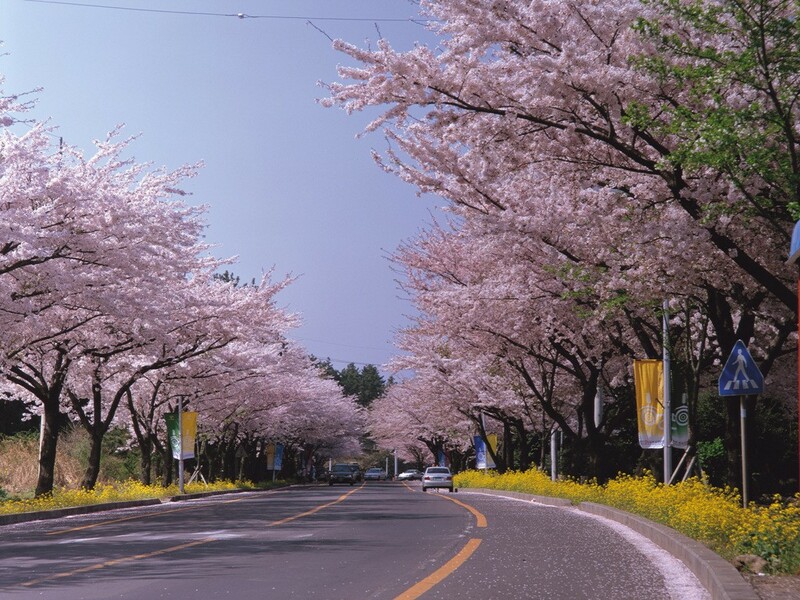 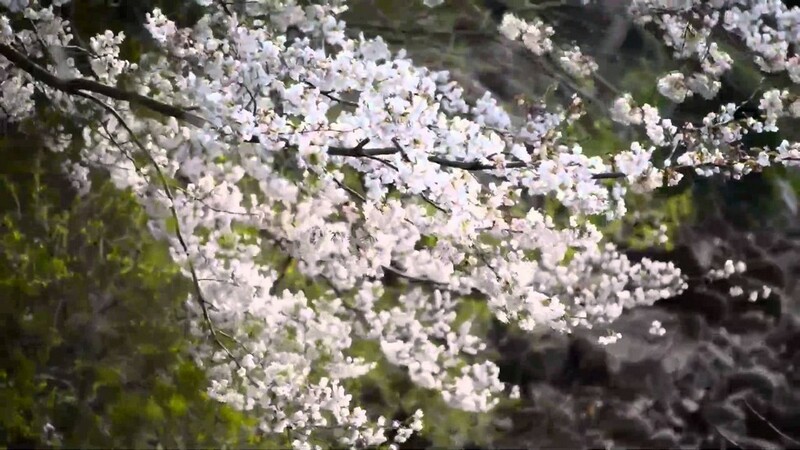 Jeju cherry blossoms are also regarded as the most magnificent flowers in South Korea thanks to its large and beautiful petals, giving a noble beauty as the King of cherry blossom. 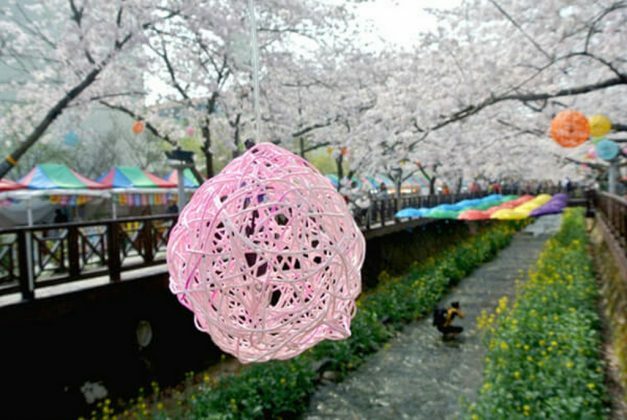 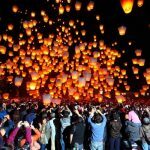 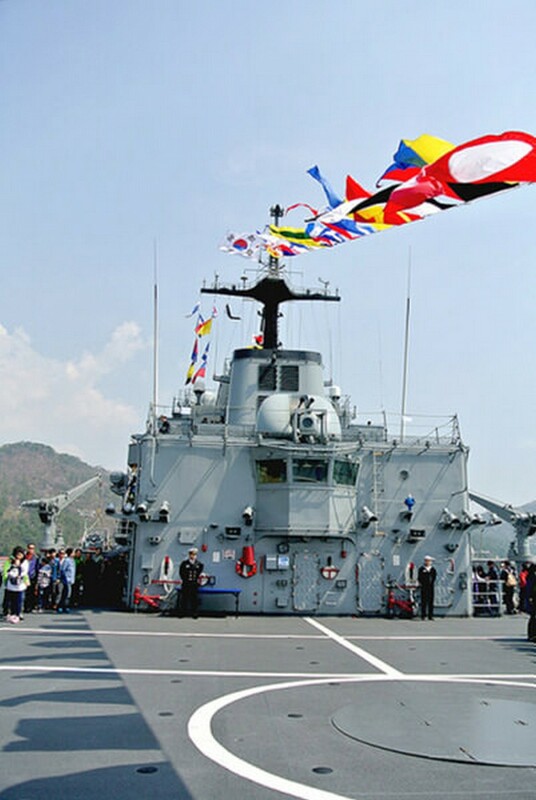 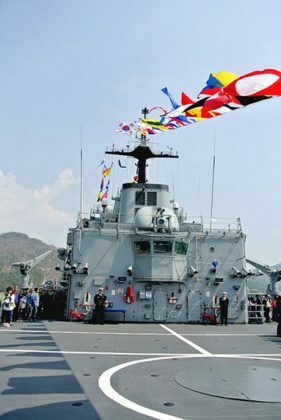 During the festival, you have a chance to immerse yourself into the romance just like dramas, watching outdoor music concerts and flower exhibition are also very appealing and worthy your time. 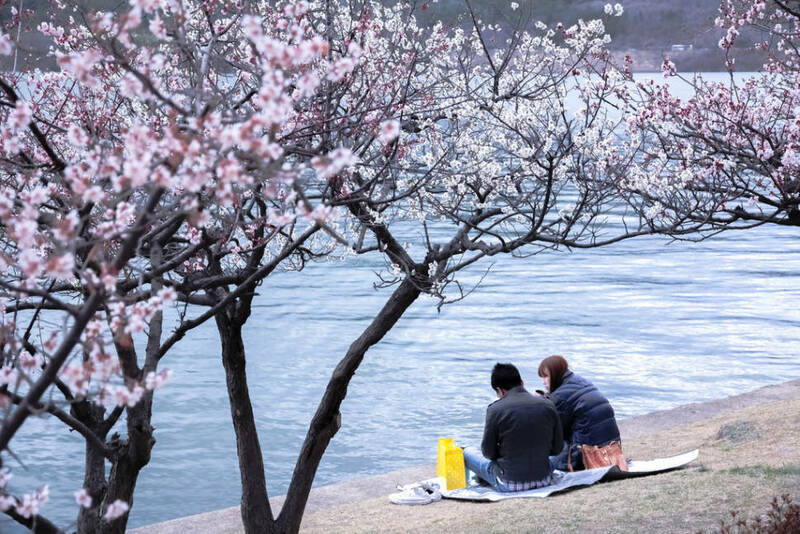 Remember to bring your cameras to take postcards-like photos with your lovers and friends. 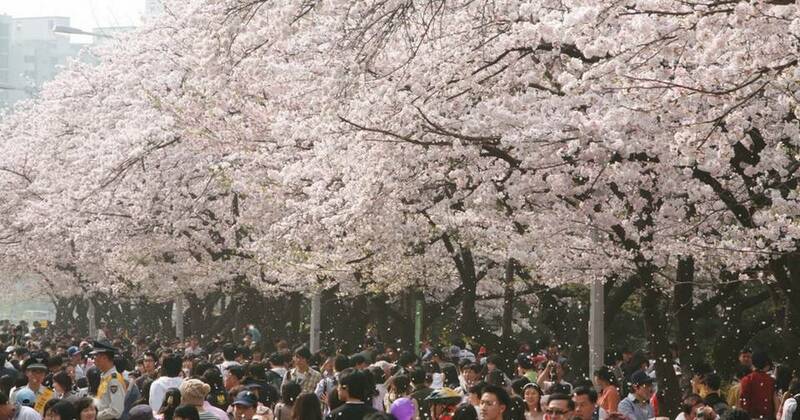 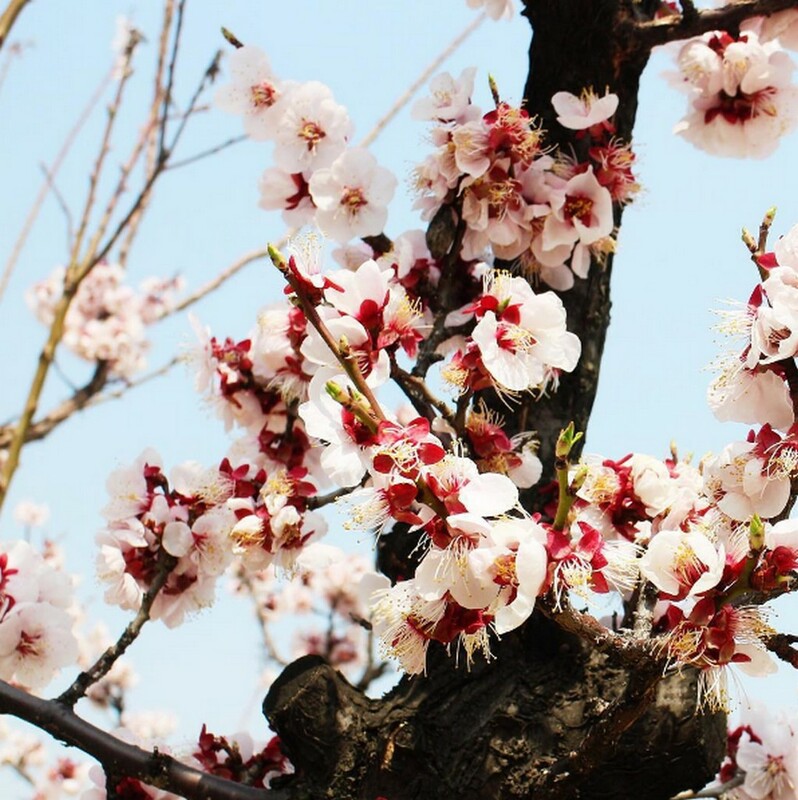 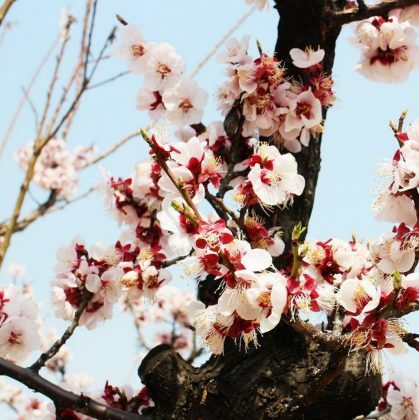 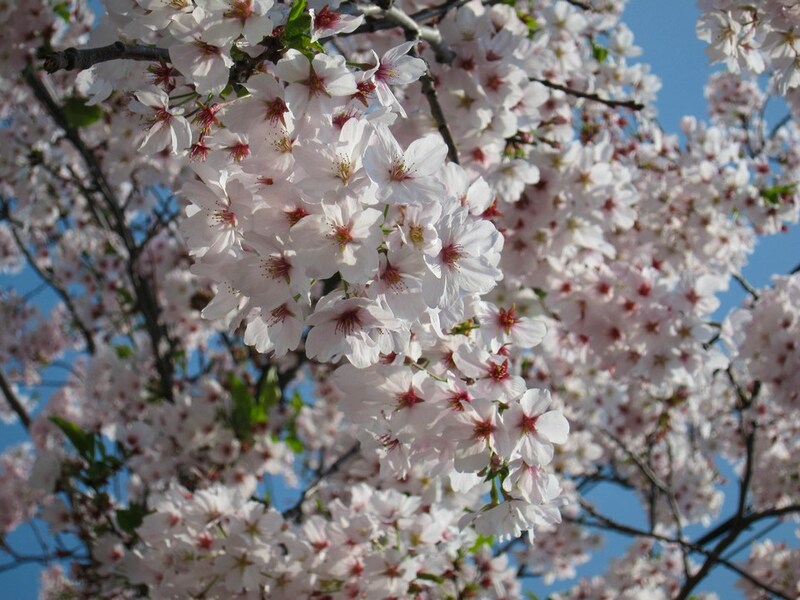 Note that the cherry flowers are only in full bloom about 3 days, you should check the official forecast and keep update with the festival. 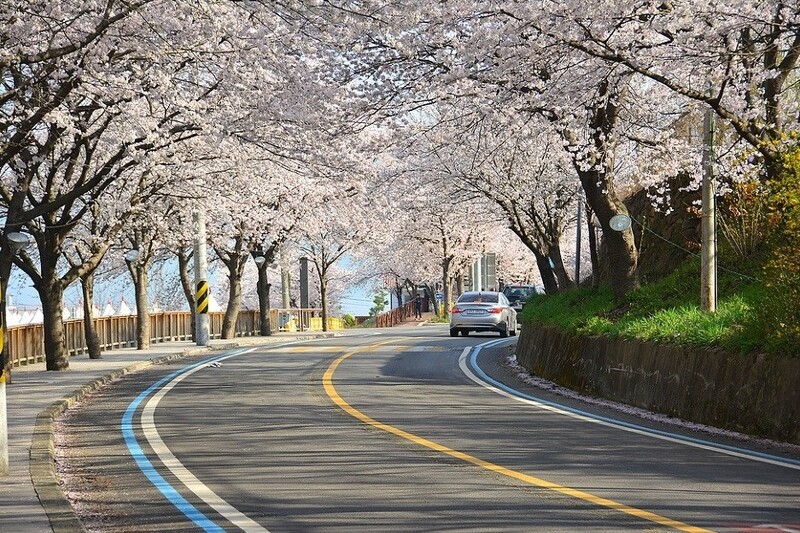 How to get: From Jeju International Airport, take the Airport Limousine bus (route 600) to Seogwipo. Journey time is around 1 hour and costs $5.80 (KRW 5,000) for a one-way trip. 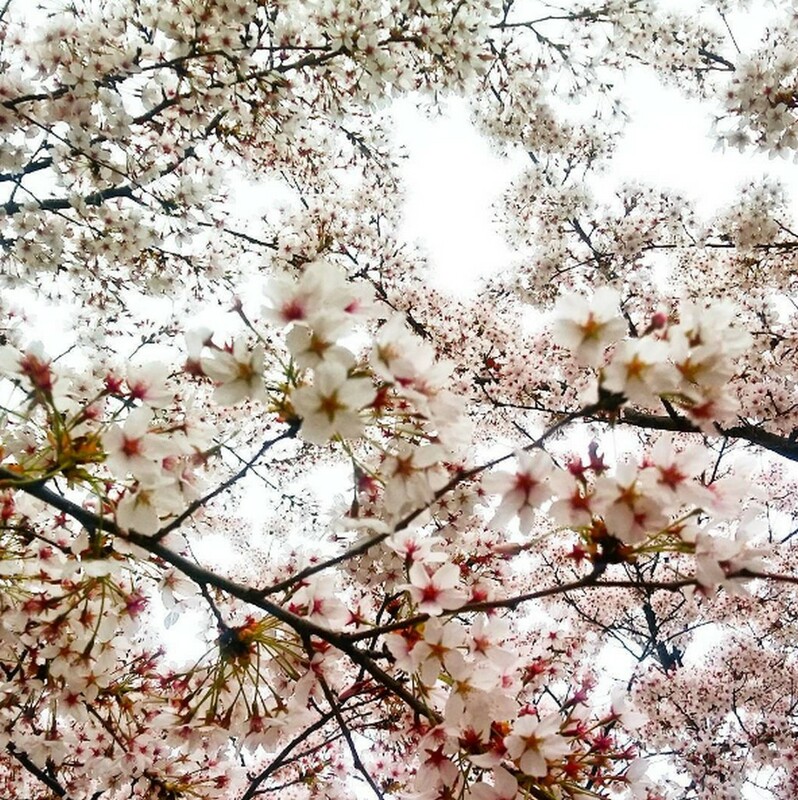 Seeing cherry blossom is absolutely a dream of many people, especially girls. 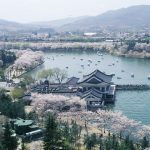 Don’t just dream about this, plan your journey, book a flight and head to South Korea to fulfill your sense of adventure.